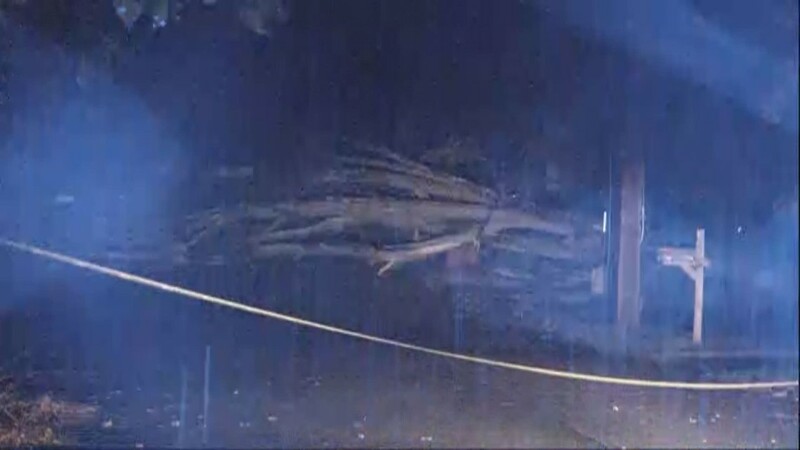 You've seen the video. 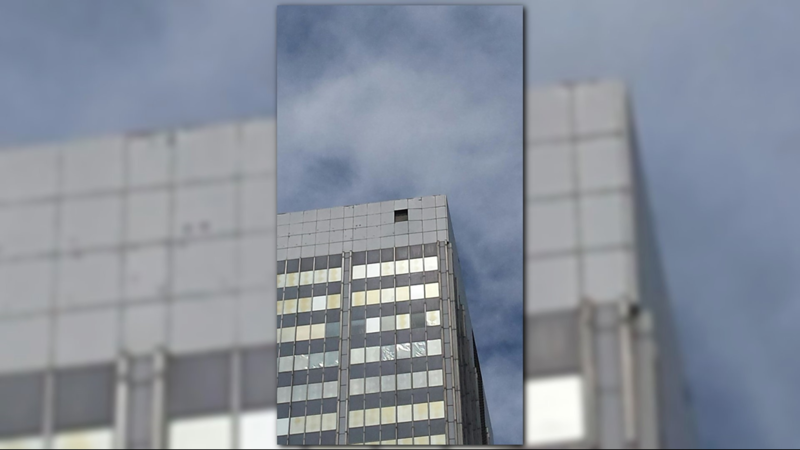 Here's the story behind it. 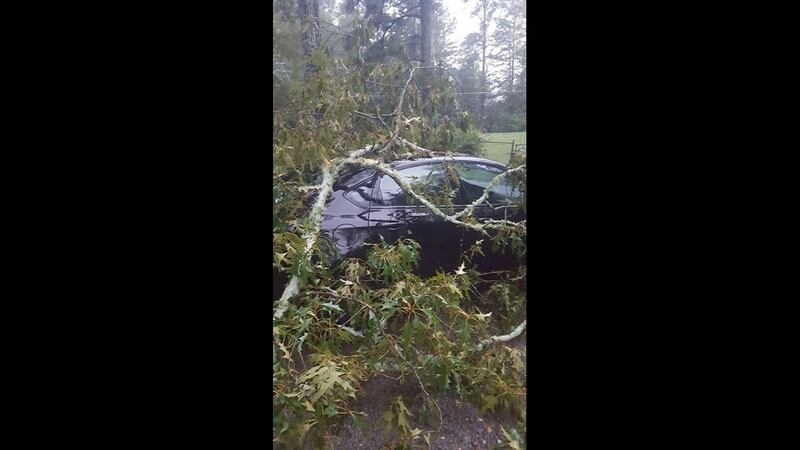 SPALDING COUNTY, Ga. -- This is why we're saying not to be on the roads. 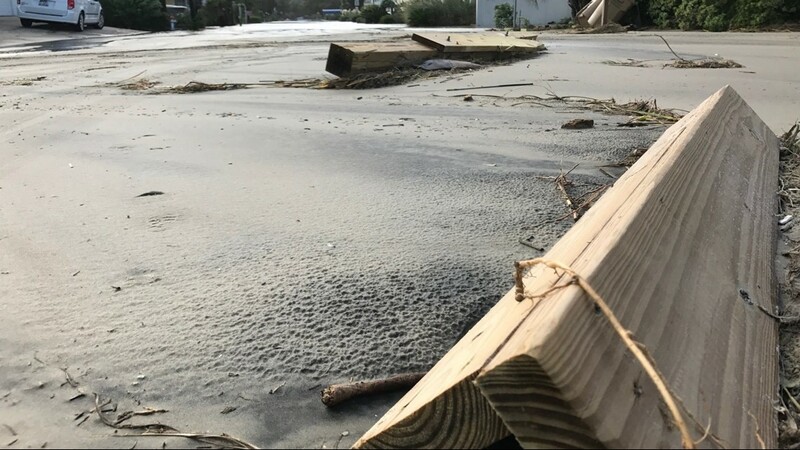 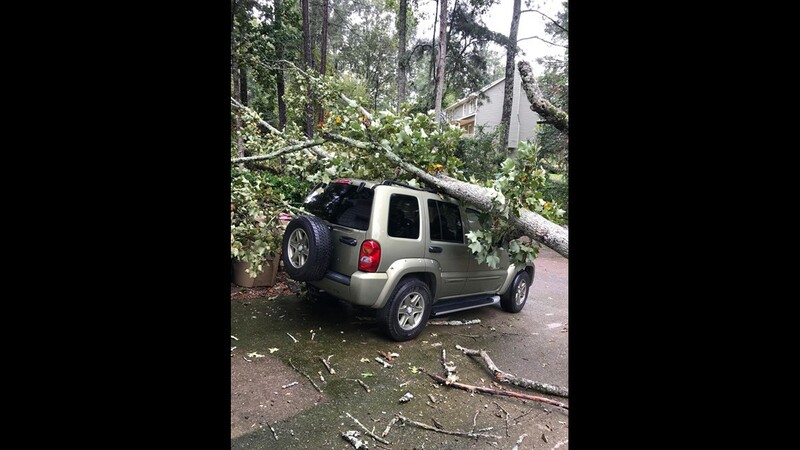 On Monday, Tropical Storm Irma blew into Georgia after wreaking havoc through the entire Florida peninsula as a strong hurricane. 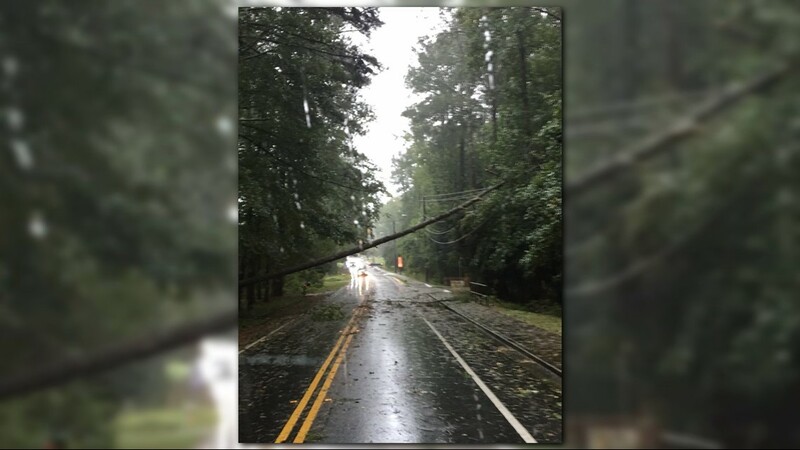 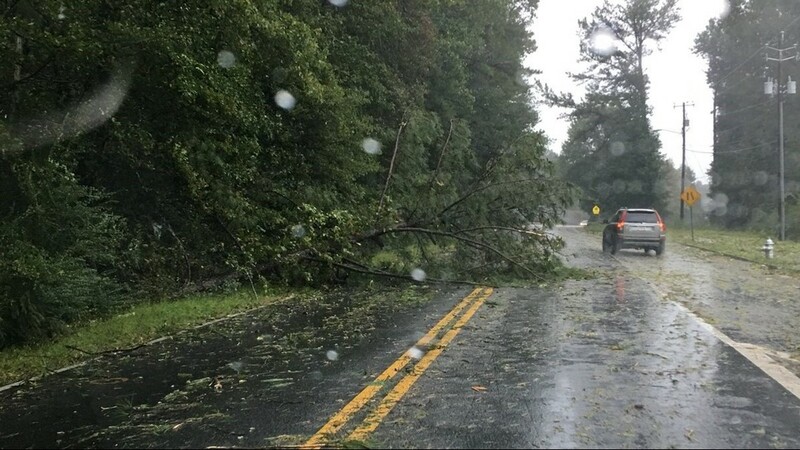 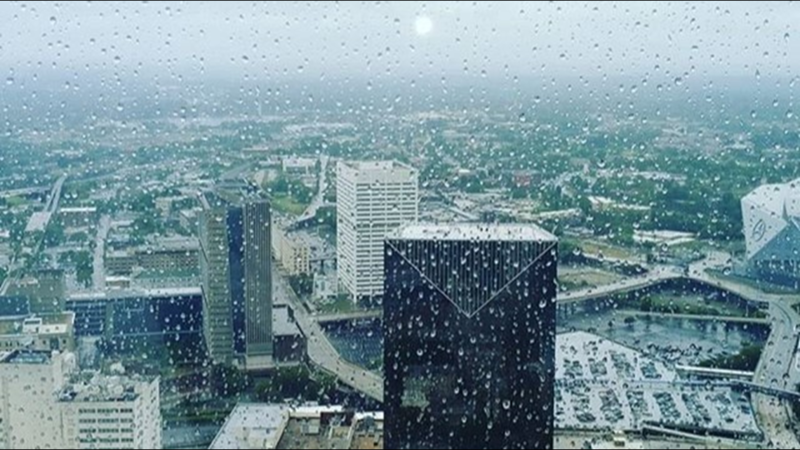 Much of Georgia was under a tropical storm warning Monday, forcing businesses and schools to close ahead of time. 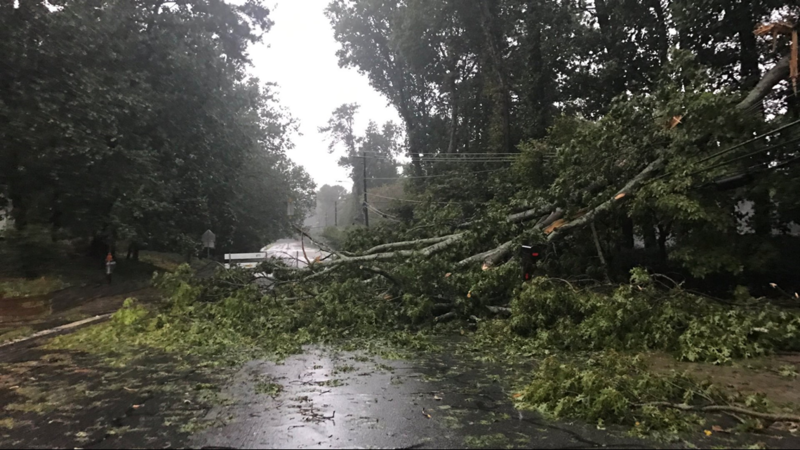 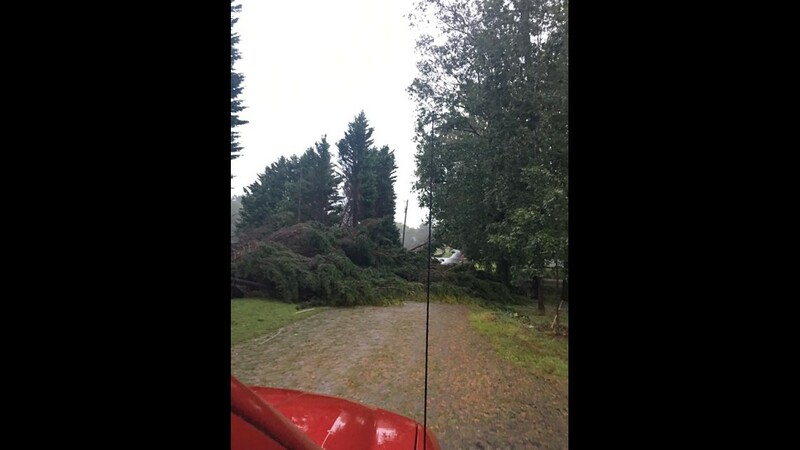 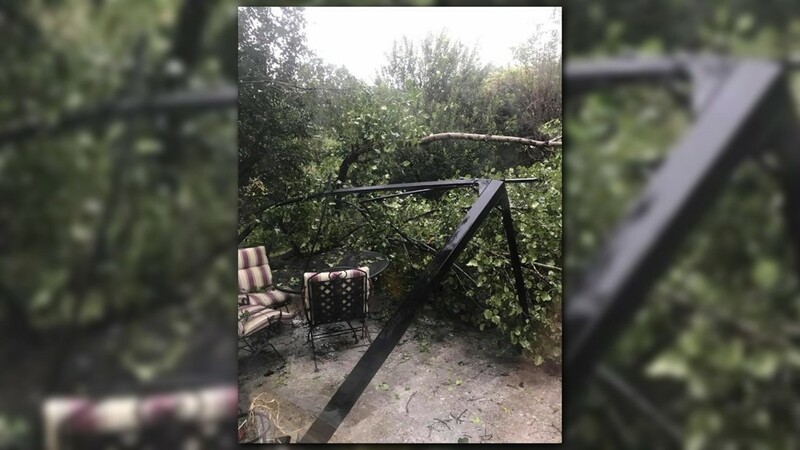 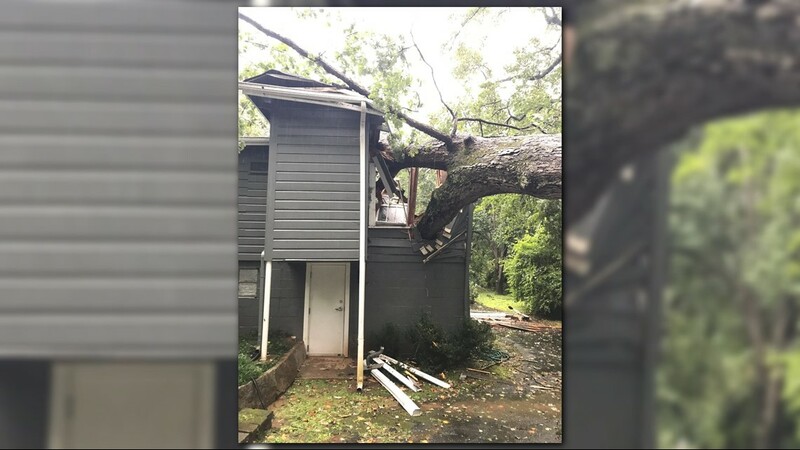 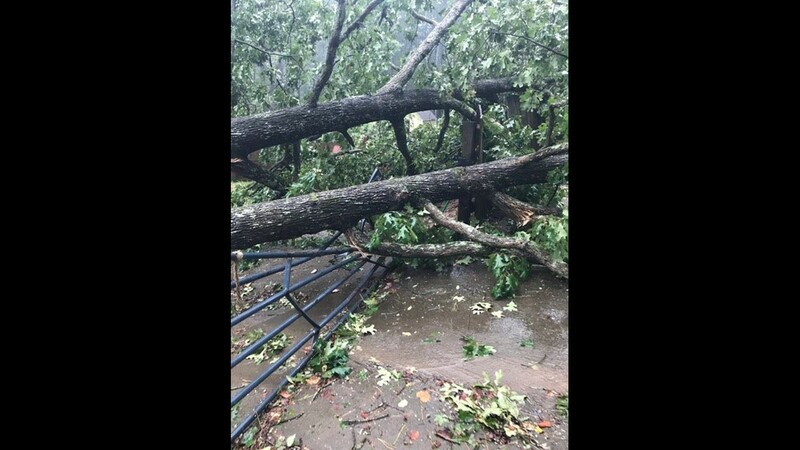 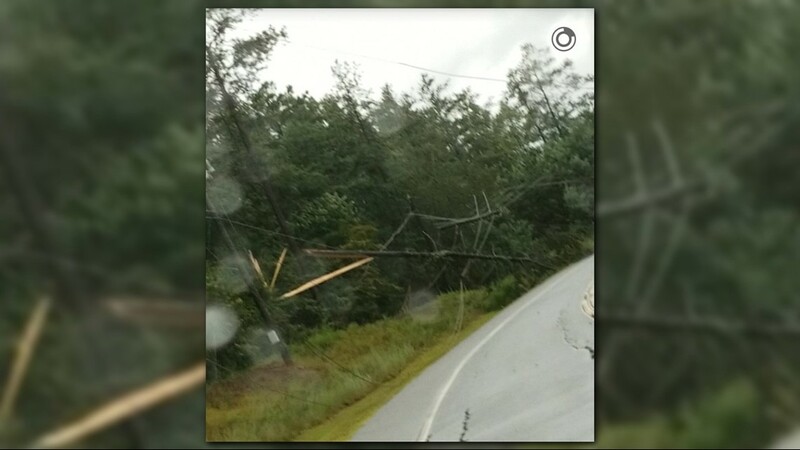 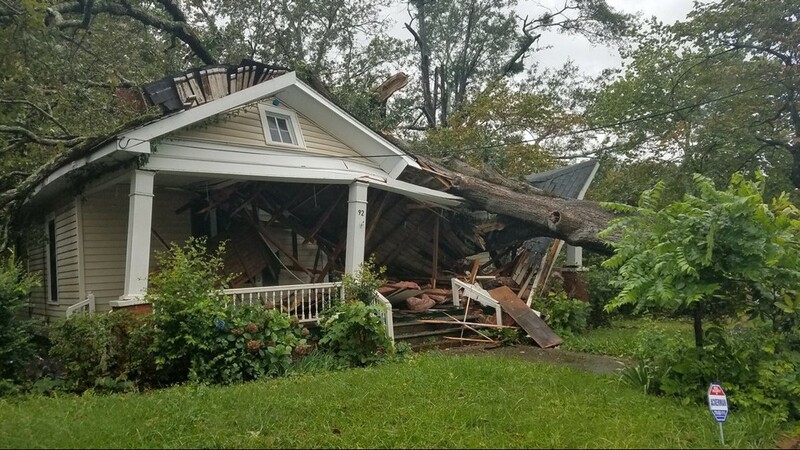 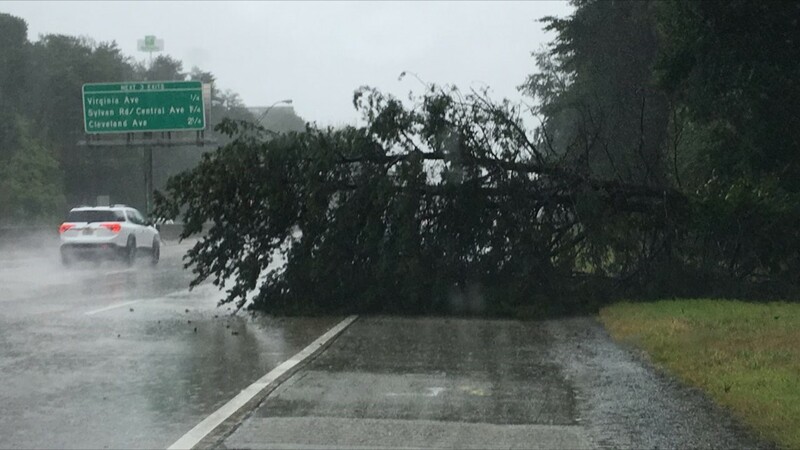 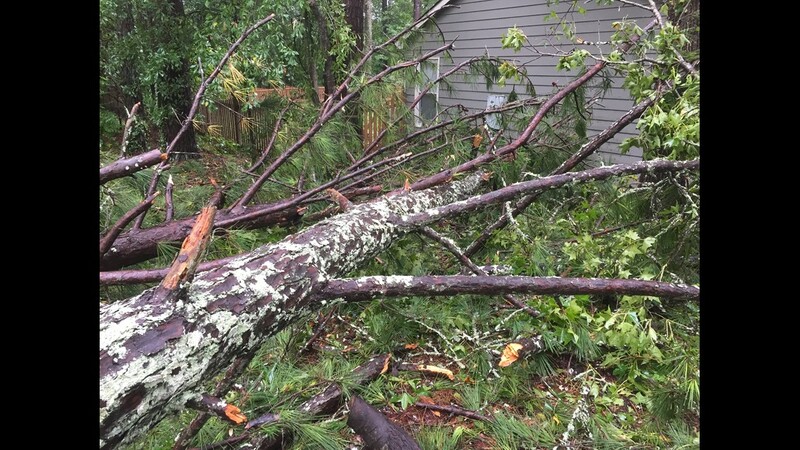 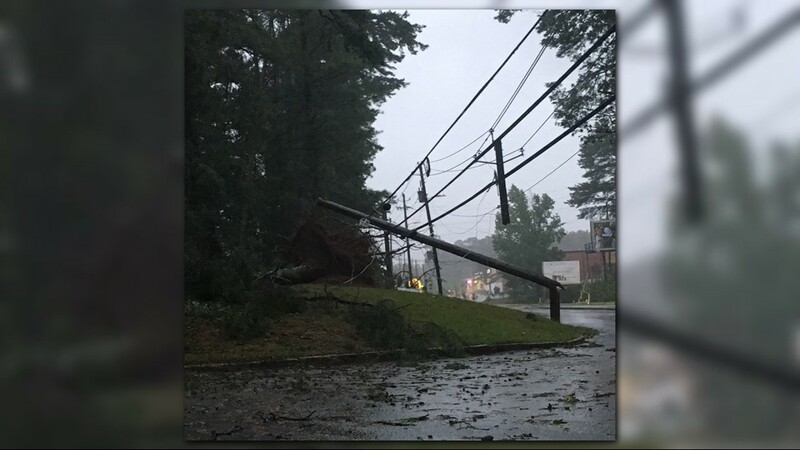 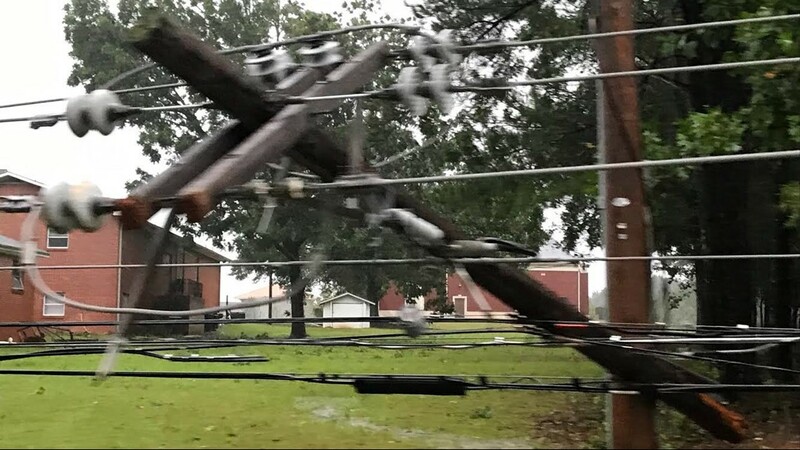 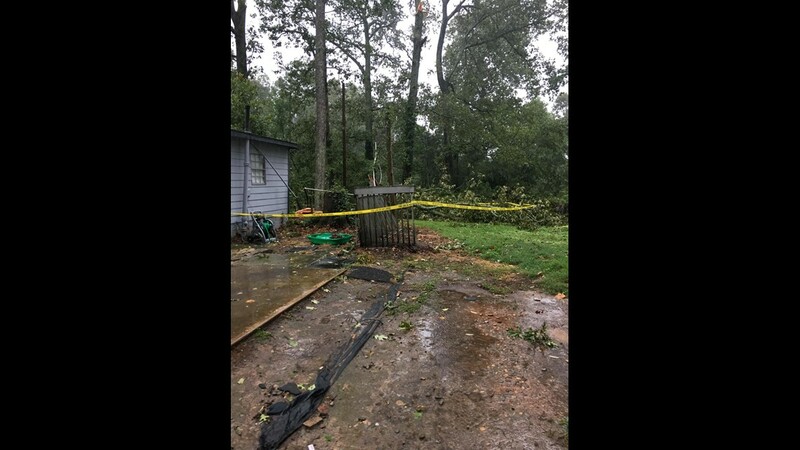 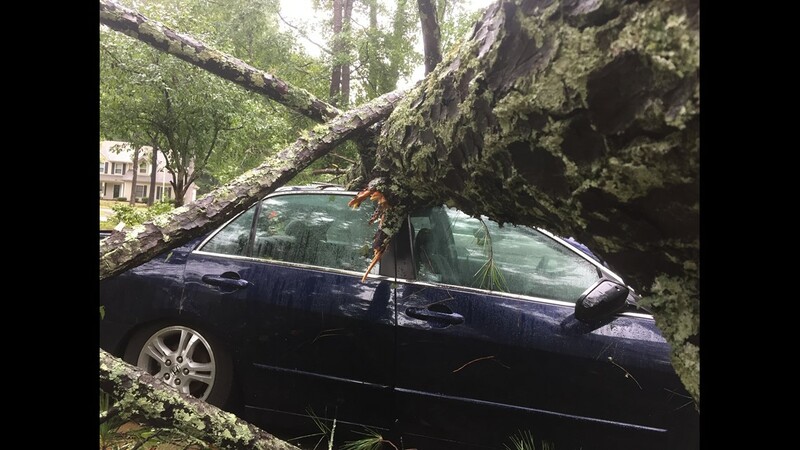 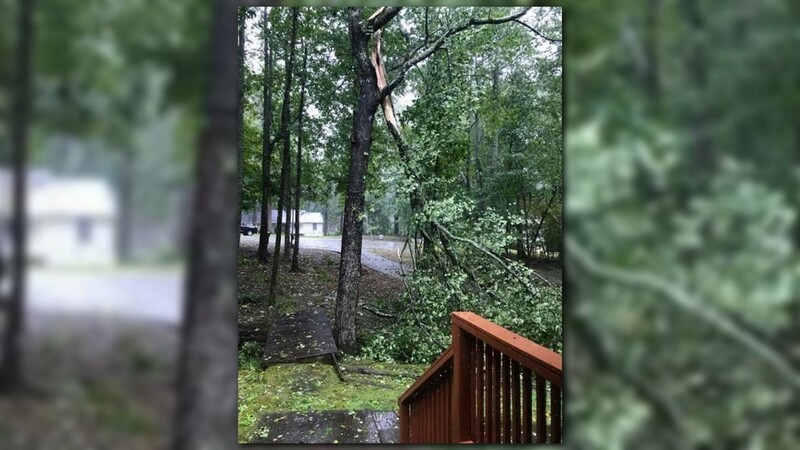 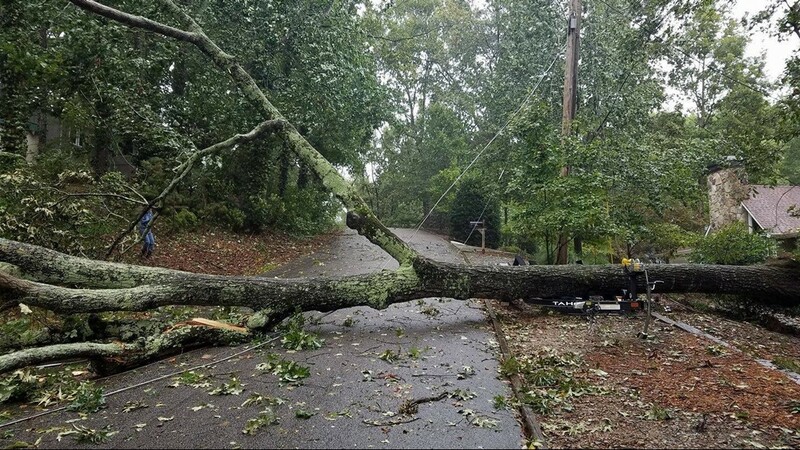 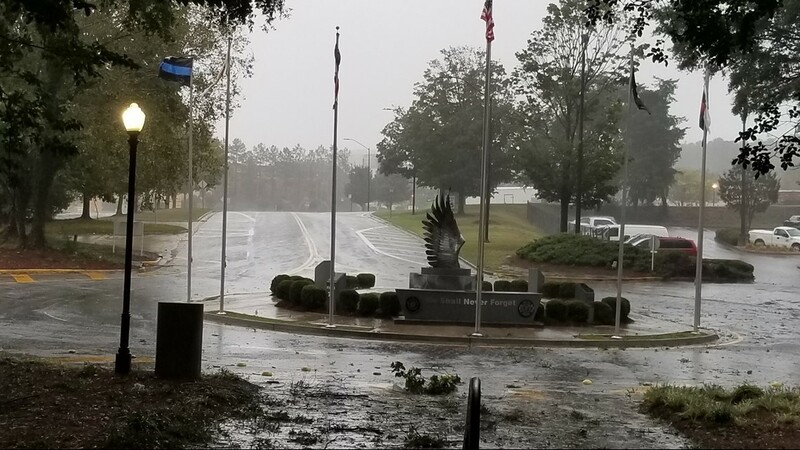 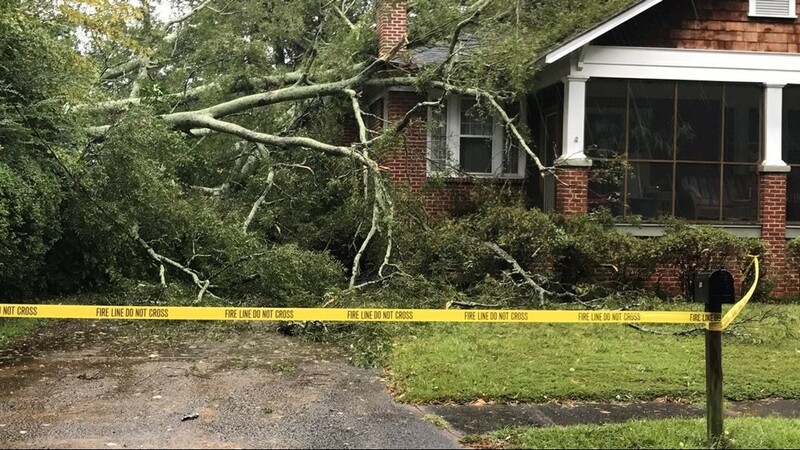 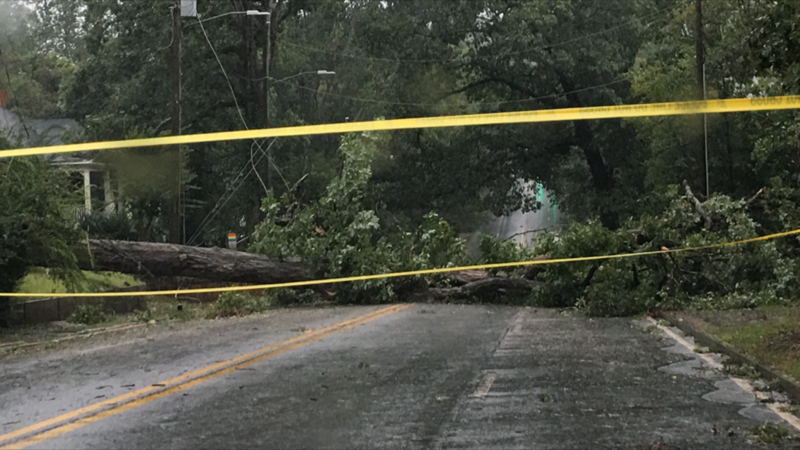 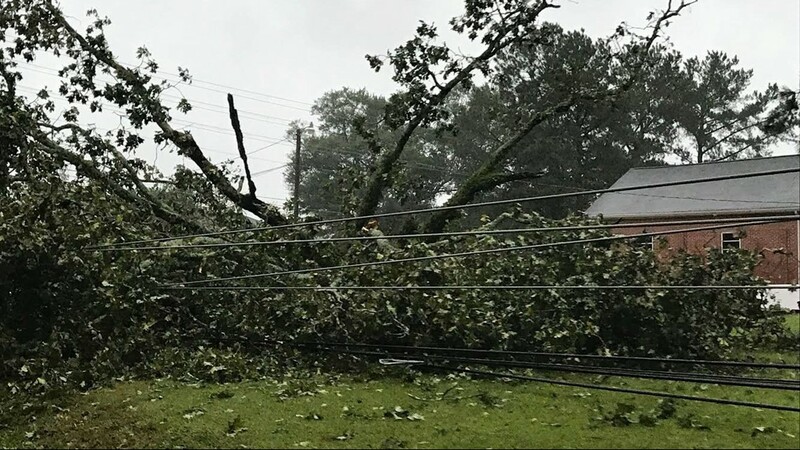 Winds from the tropical system toppled large trees, dumped heavy rains and knocked out power to millions of customers across the state. 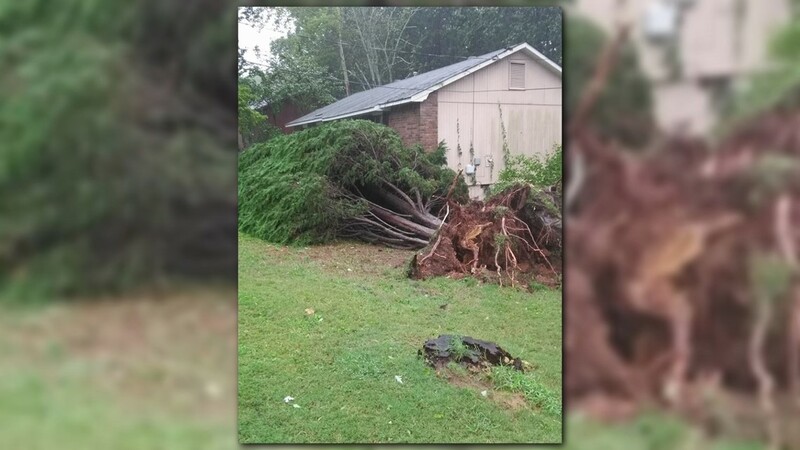 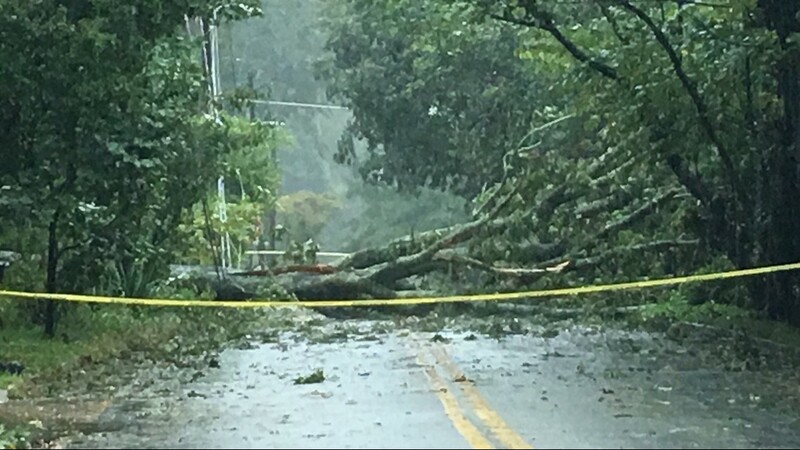 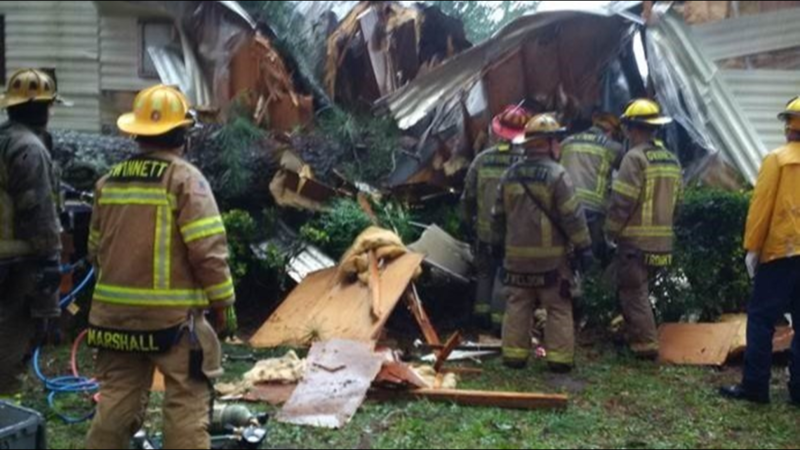 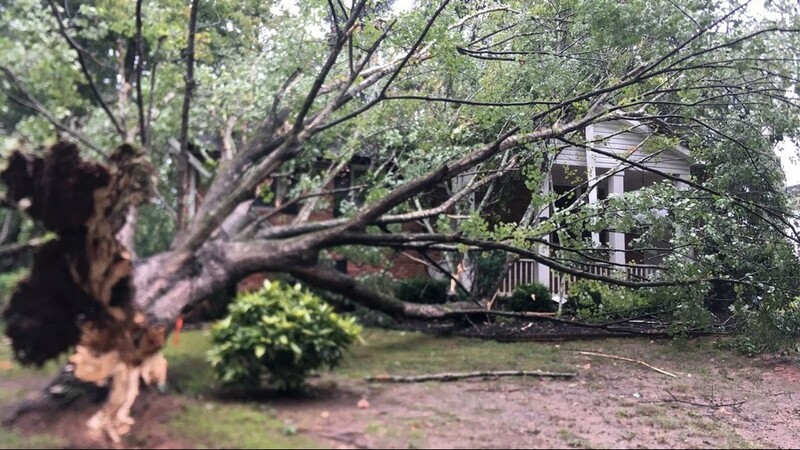 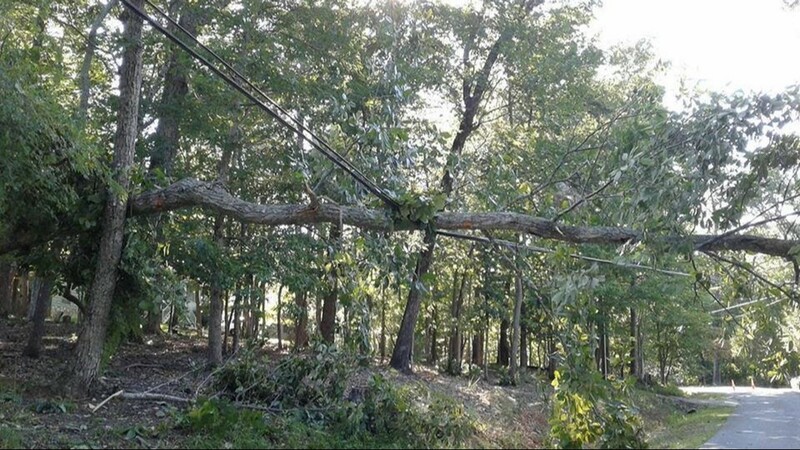 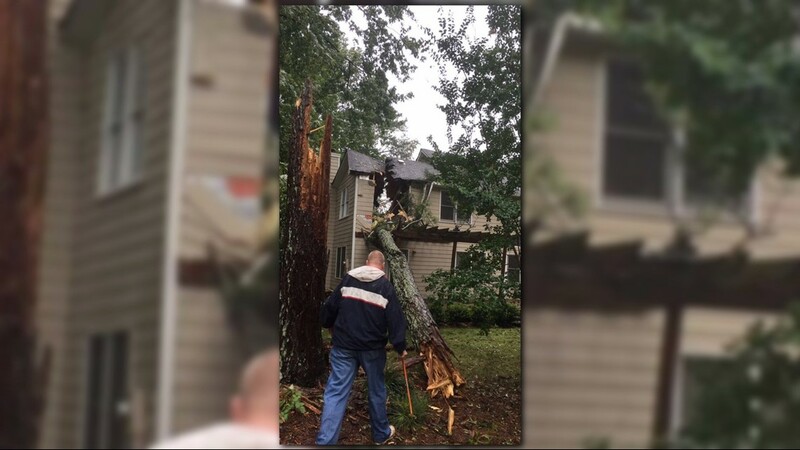 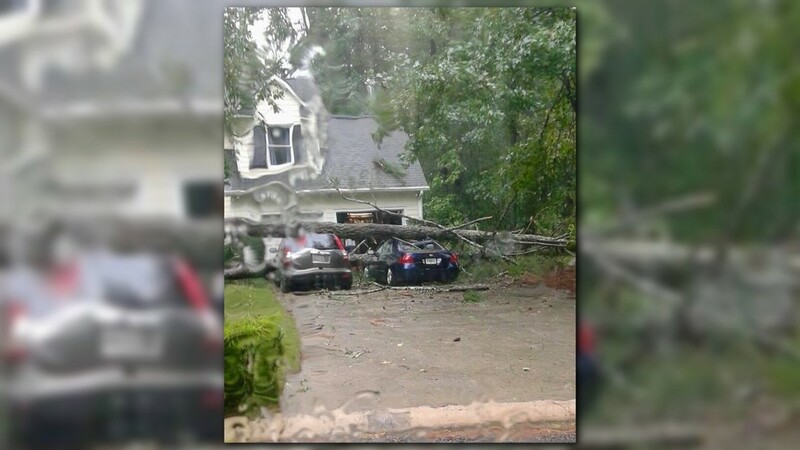 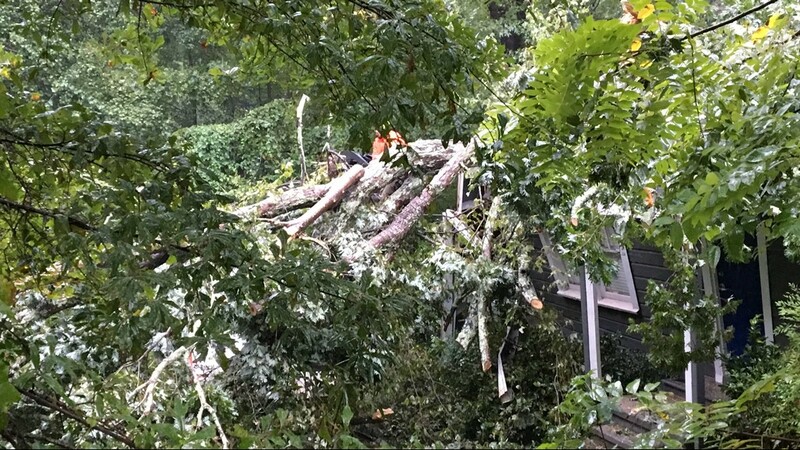 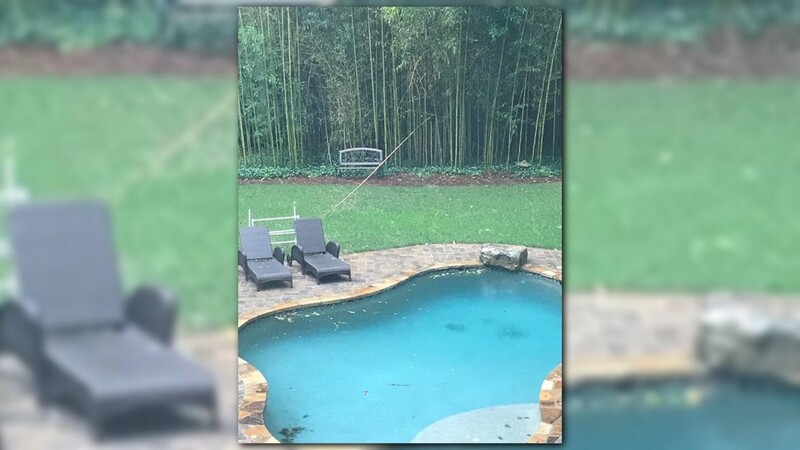 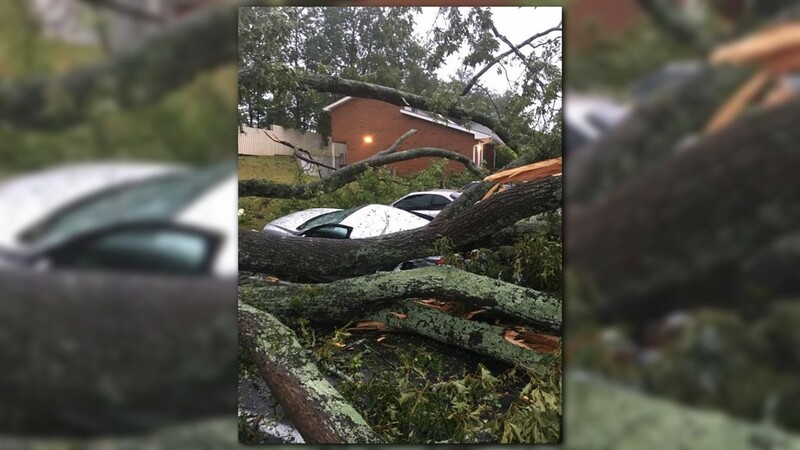 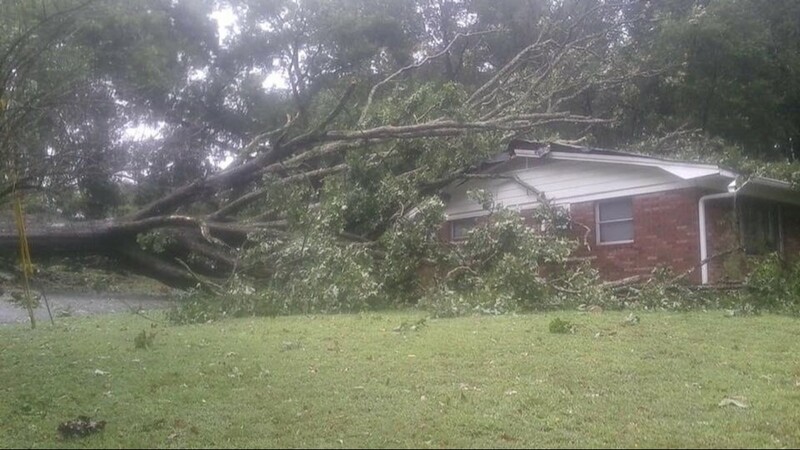 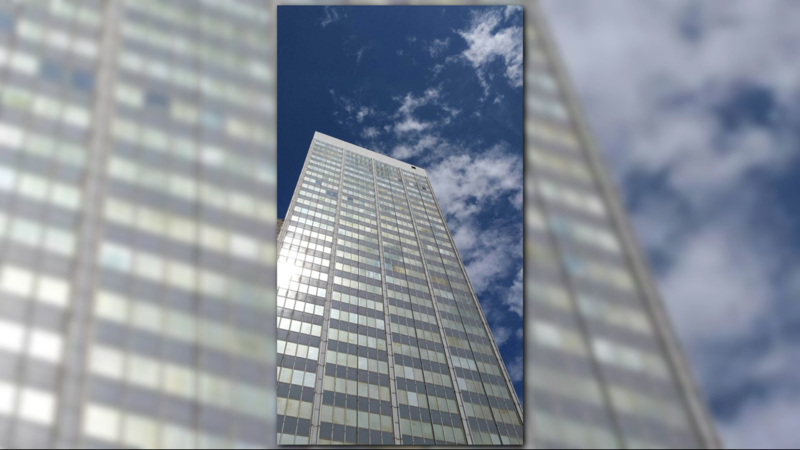 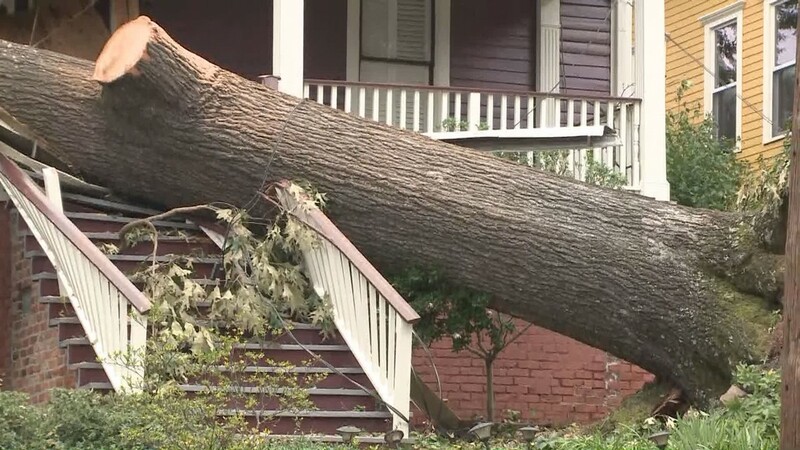 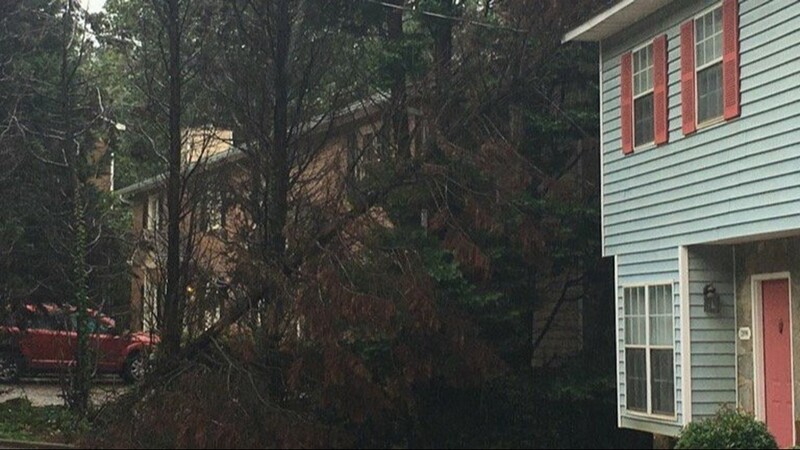 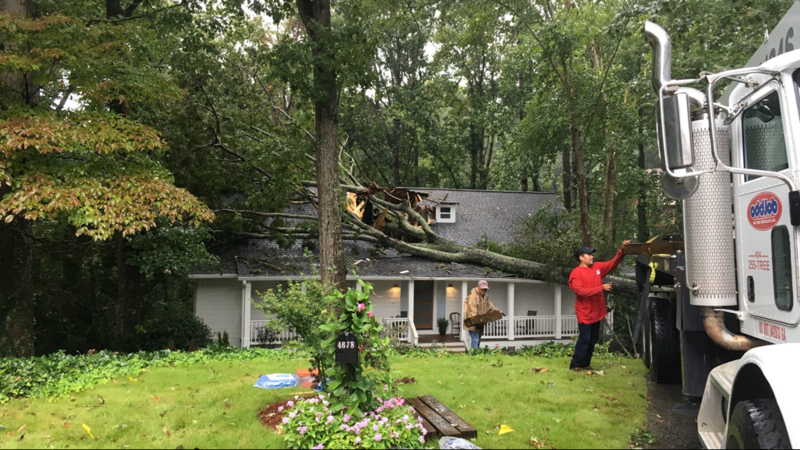 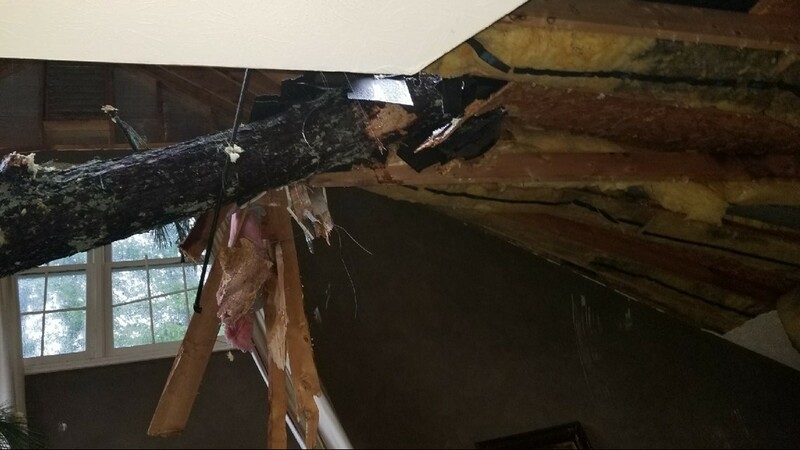 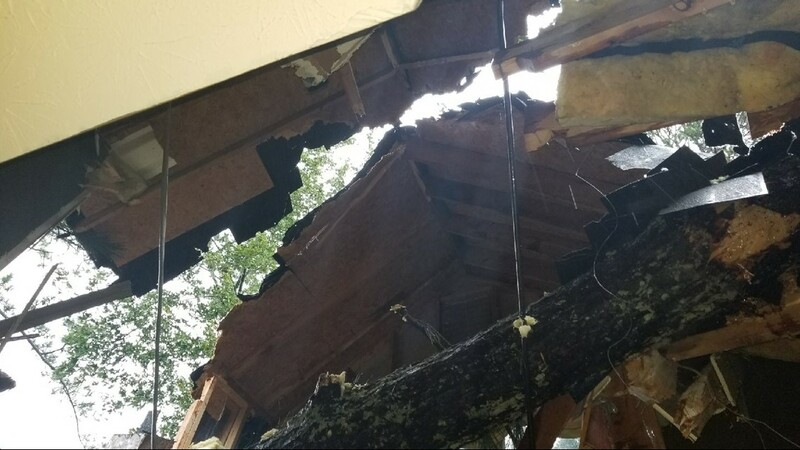 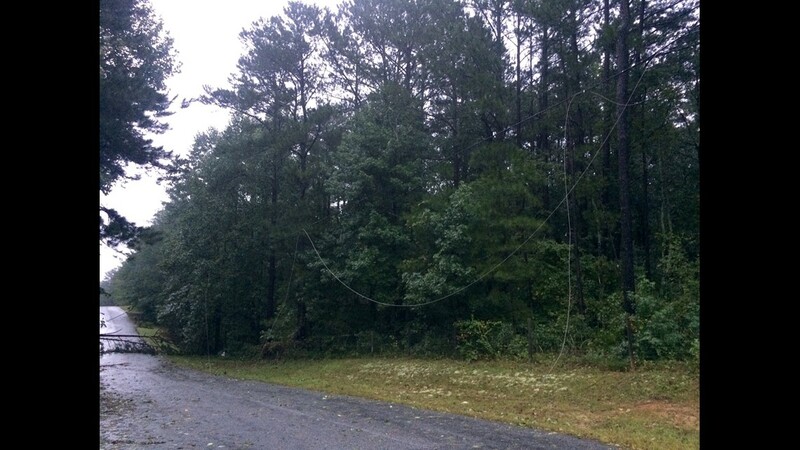 Falling trees from the storm are also believed to be responsible for three deaths Monday. 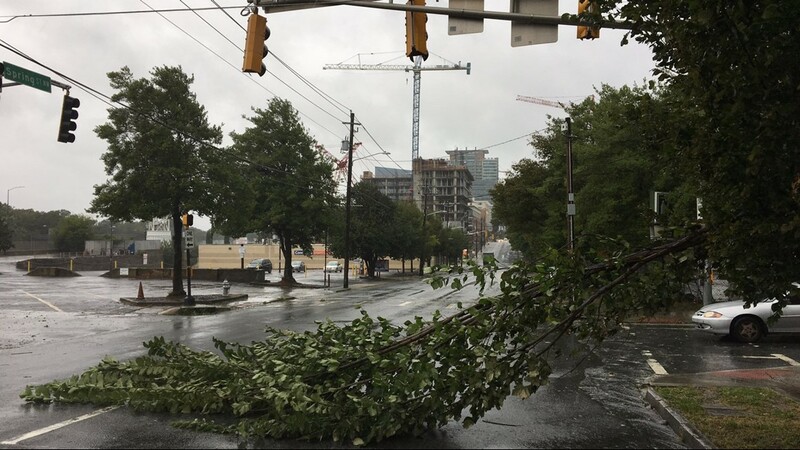 Despite the storm's weakened state, it was still strong enough to make driving a treacherous task. 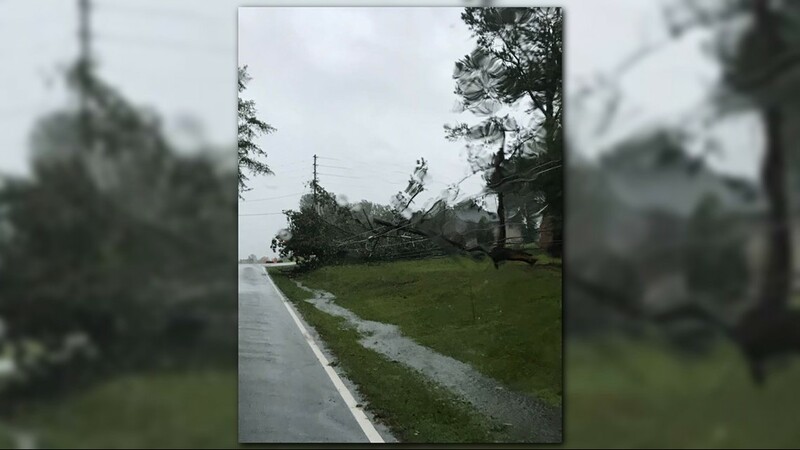 In shocking dash cam video from Spalding County, the driver of a white Lexus was unable to avoid a falling pine tree and slammed into the trunk. 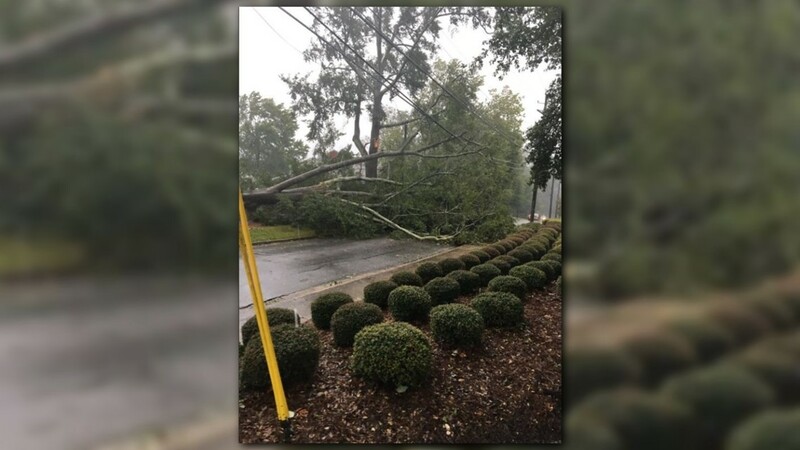 11Alive spoke to the driver who captured the video, Michael Head, who said he was on his way home when the incident happened. 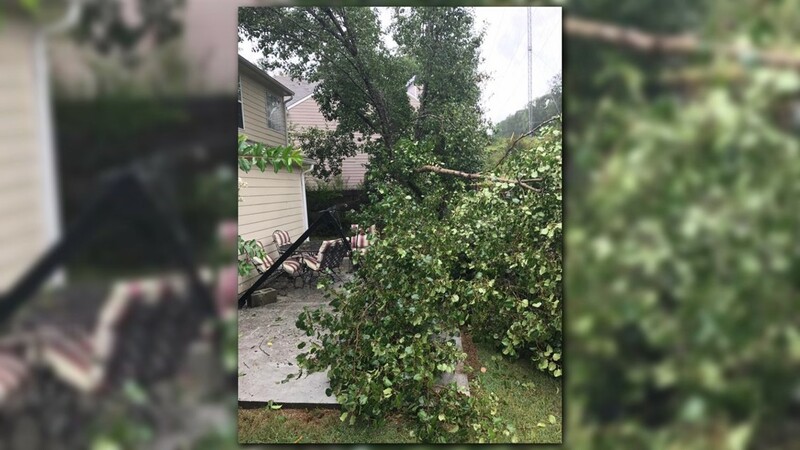 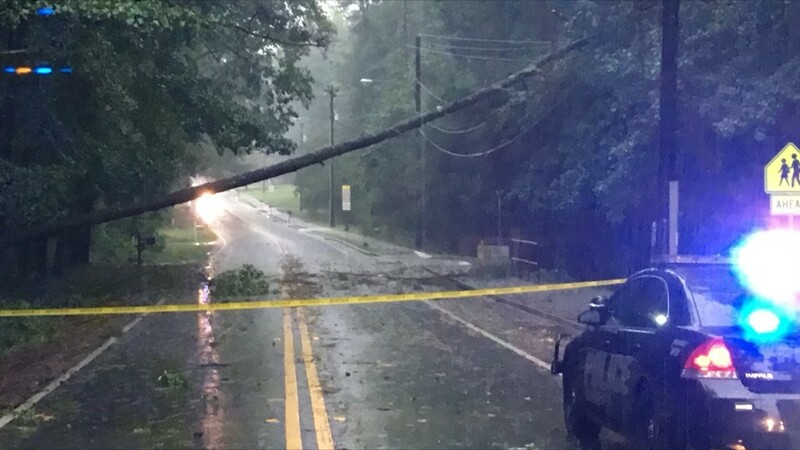 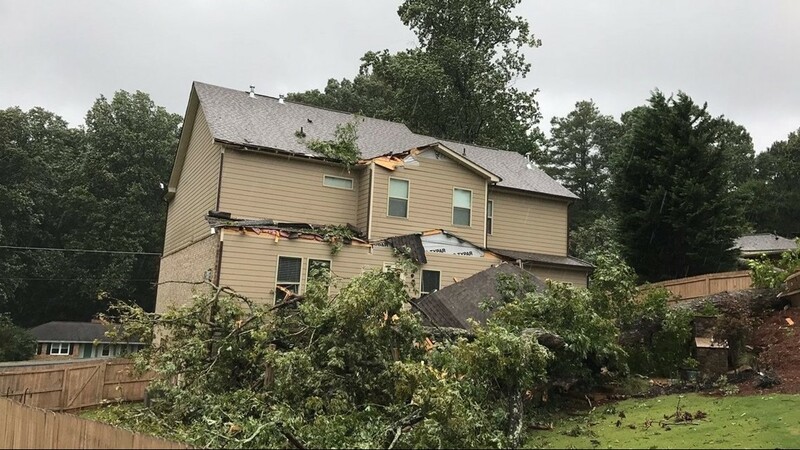 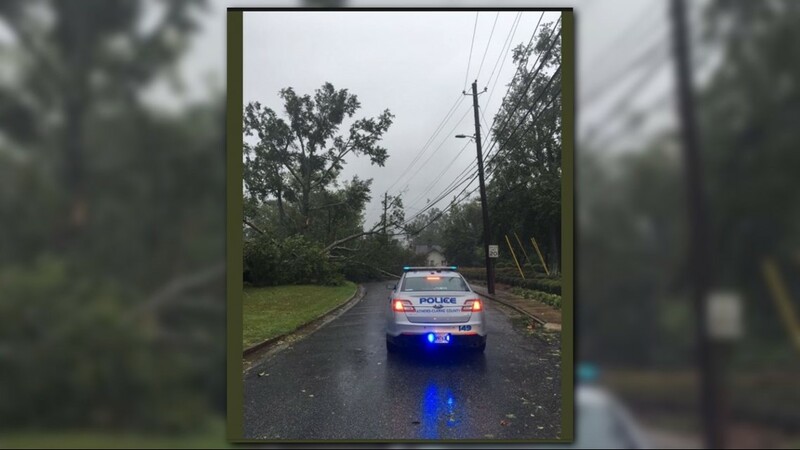 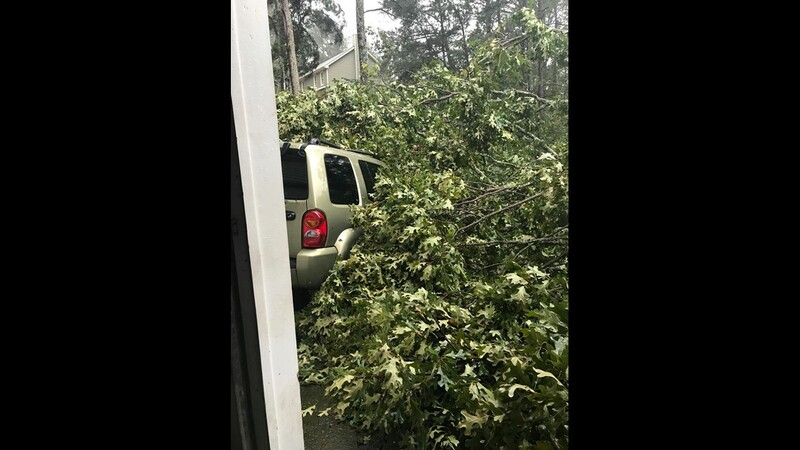 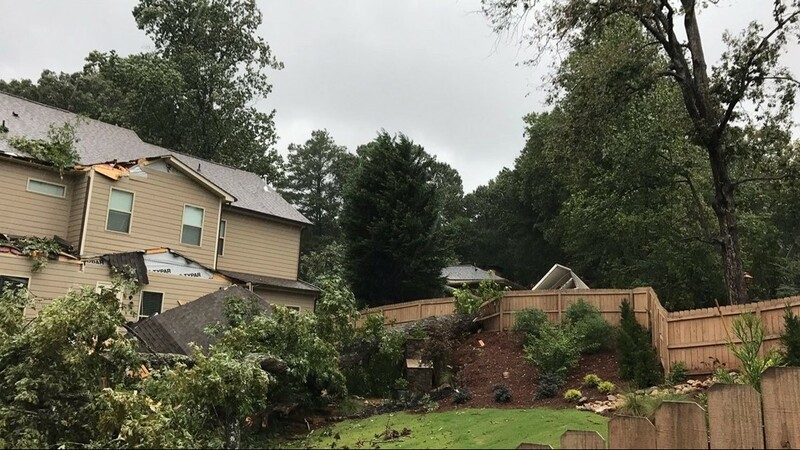 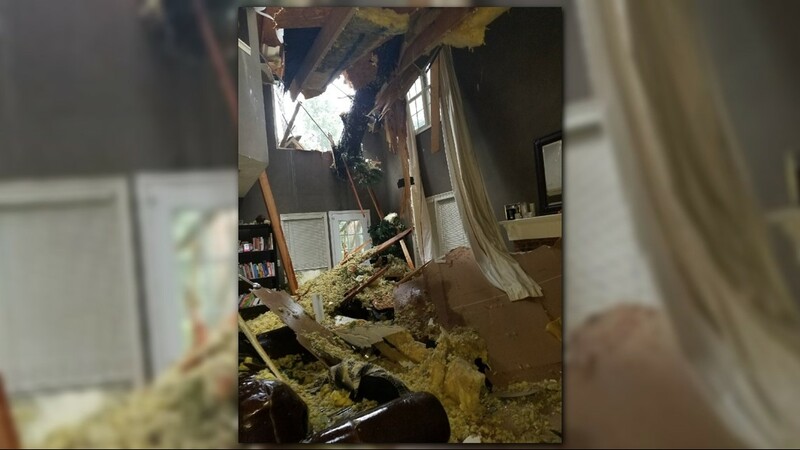 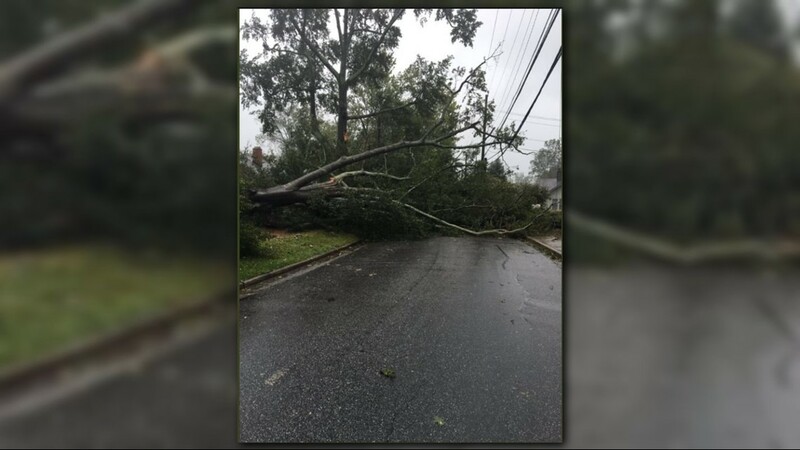 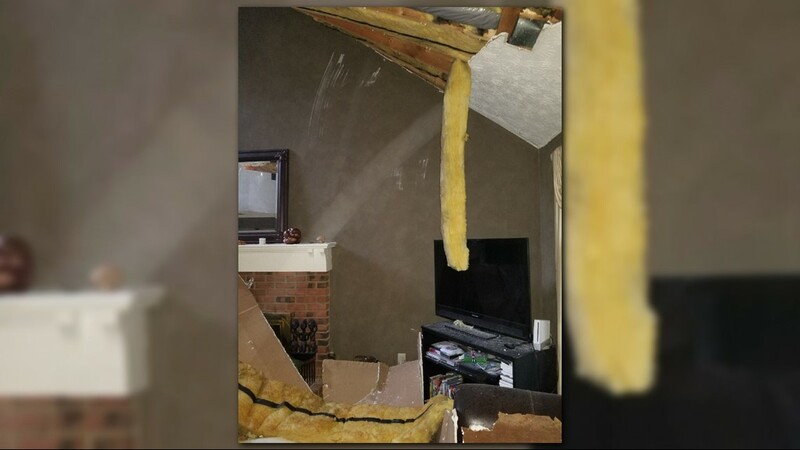 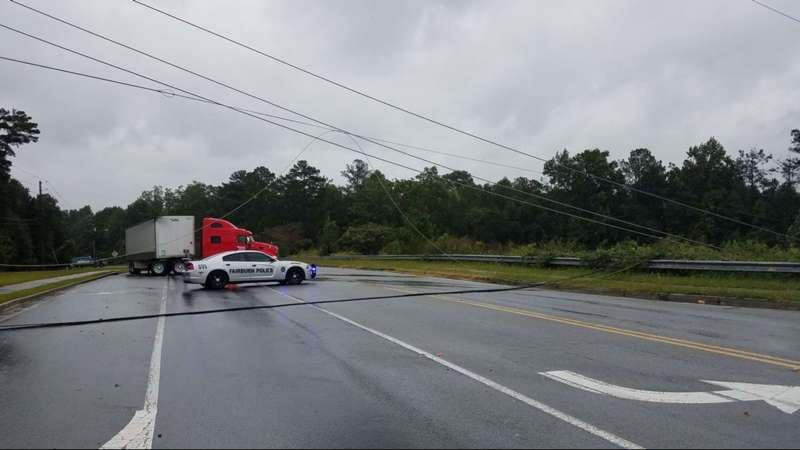 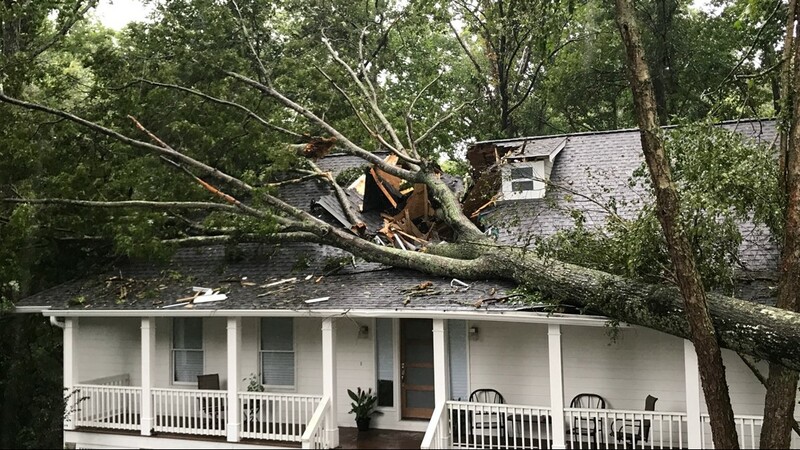 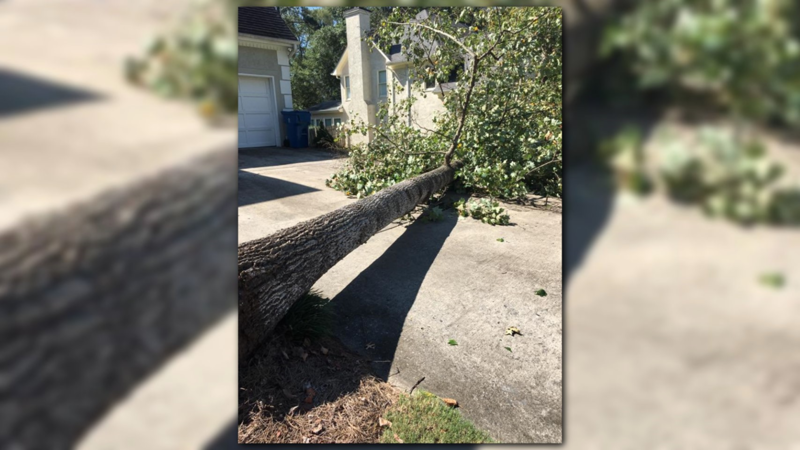 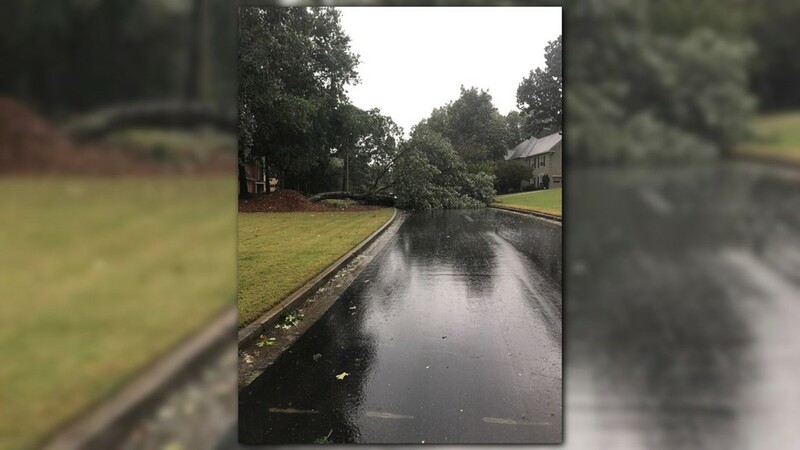 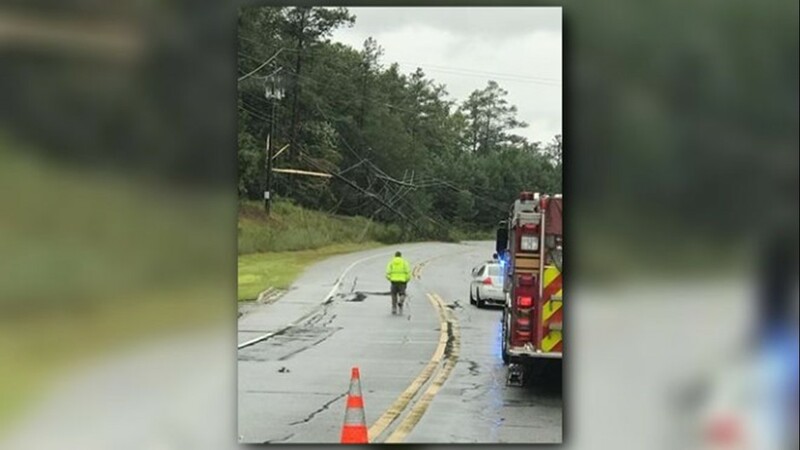 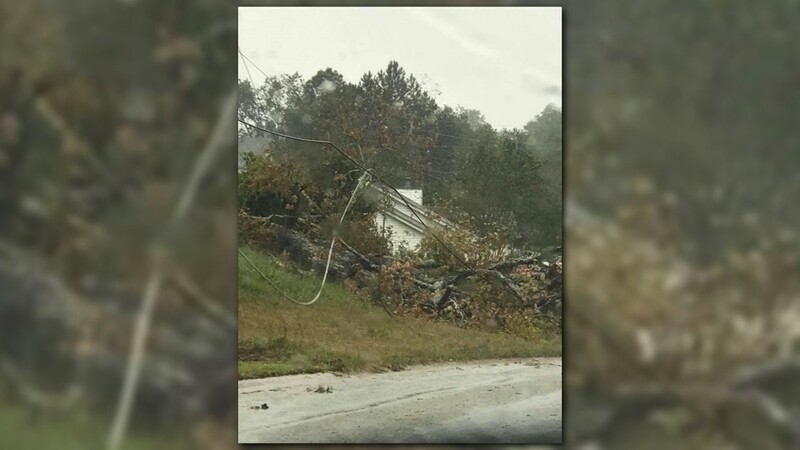 "I was coming from downtown Griffin and was heading home, and I had been following the car for a while," the Peachtree City resident said. 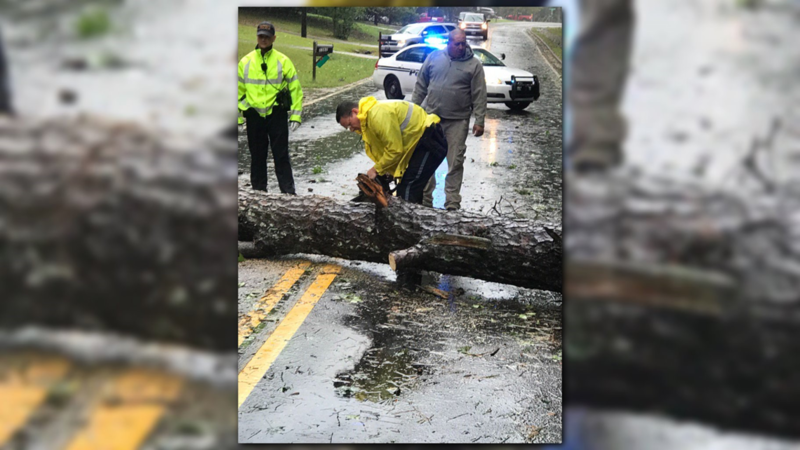 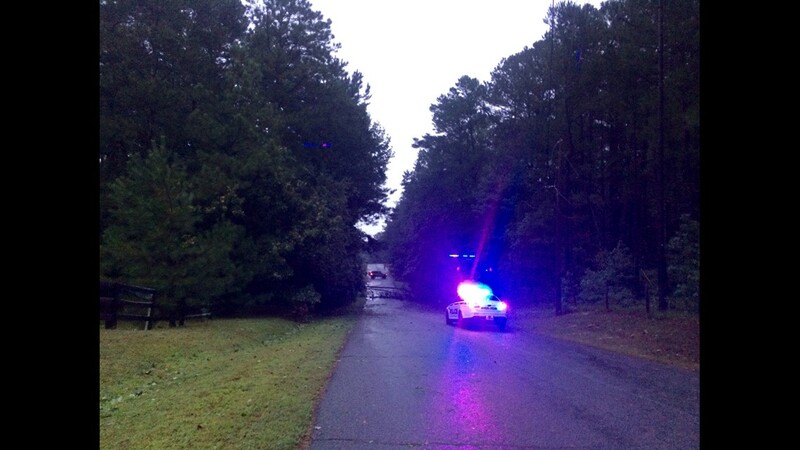 As they were driving down a hill on Hwy 92 near Vaughn Road, Head said he noticed the tree beginning to fall. 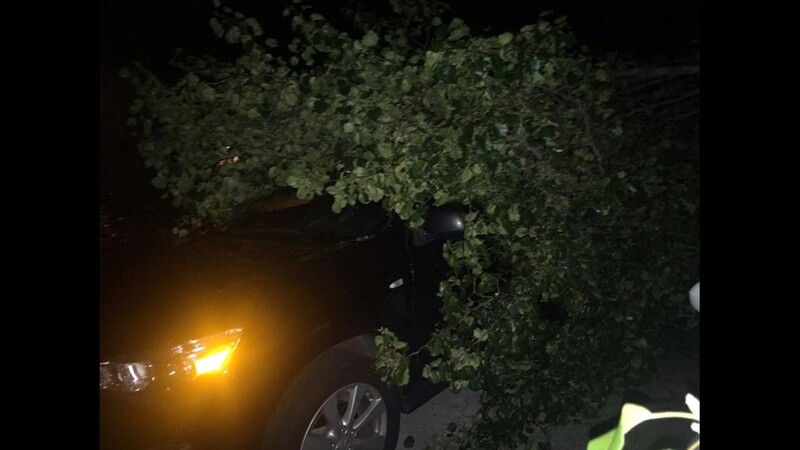 "She (driver of the Lexus) slammed on the breaks," he said. 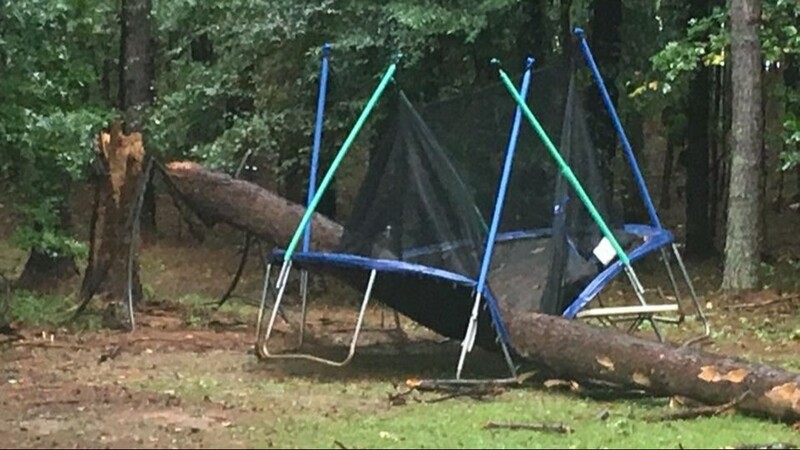 "Thank God she saw it in time." 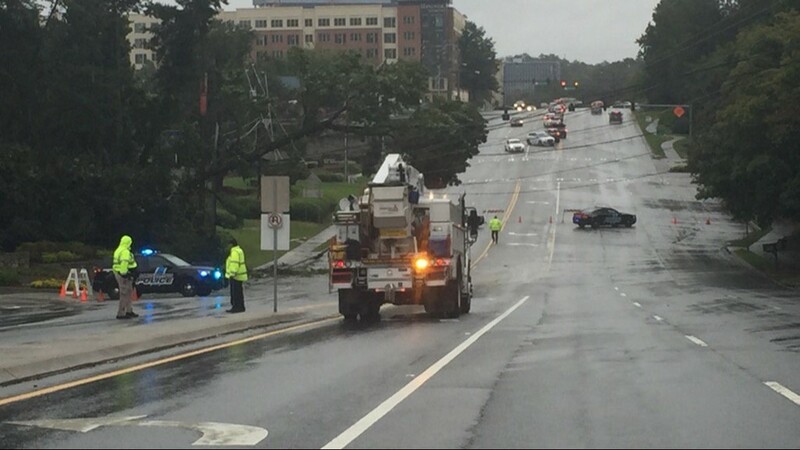 Head said he jumped out of the car and immediately went to the woman. 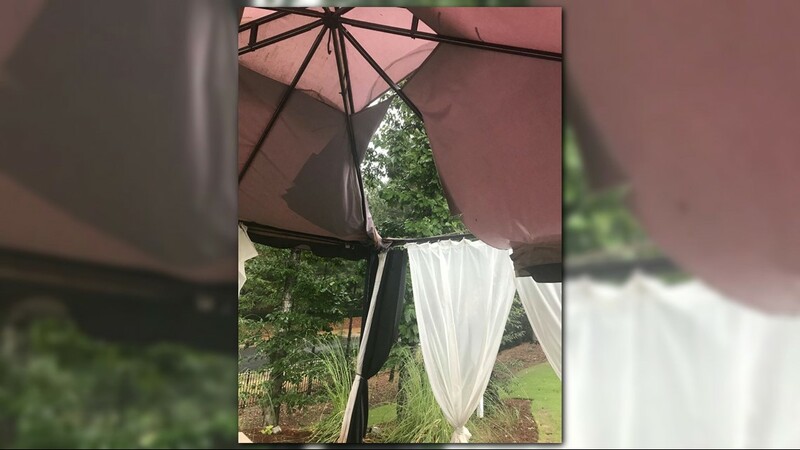 "She was shaken, but OK," he said. 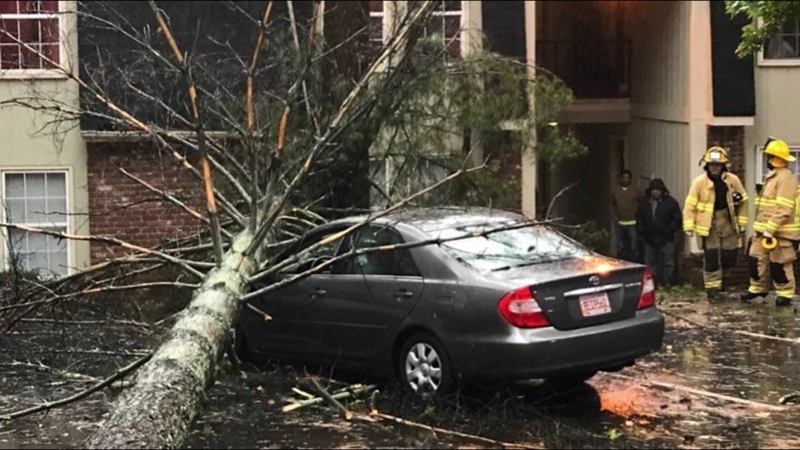 "I think she was more scared about the fraction of a second of what could have happened." 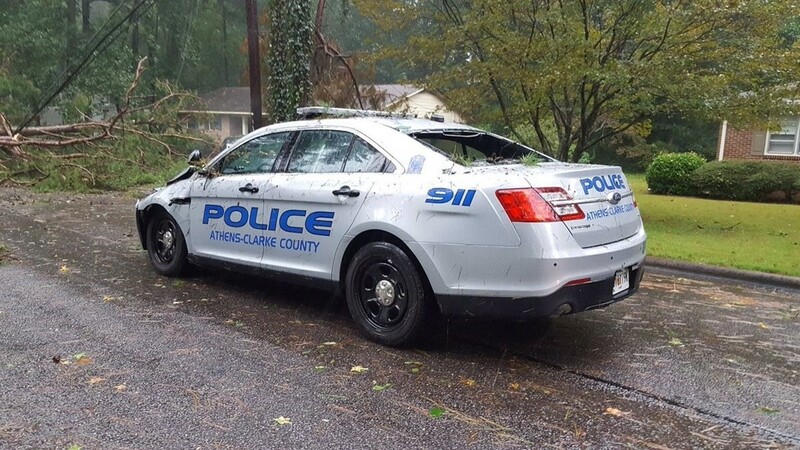 Head said he called 911 and the driver's husband, then waited for police to get to the scene. 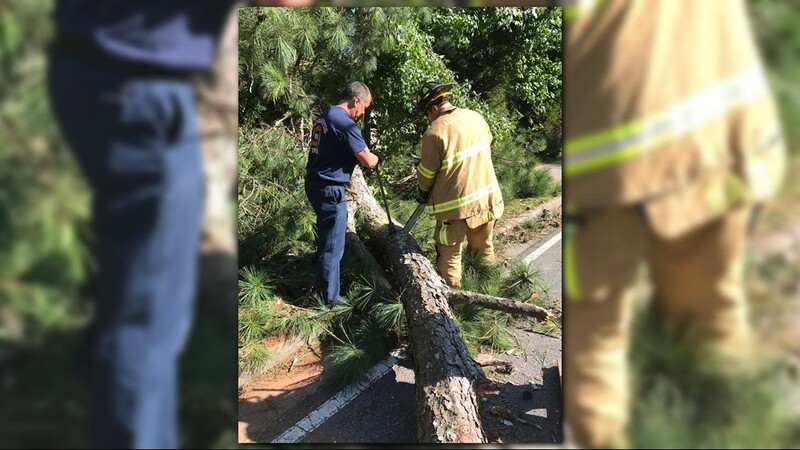 When first responders got there, they went back to the top of the hill with and away from the swaying trees lining the two-lane road. 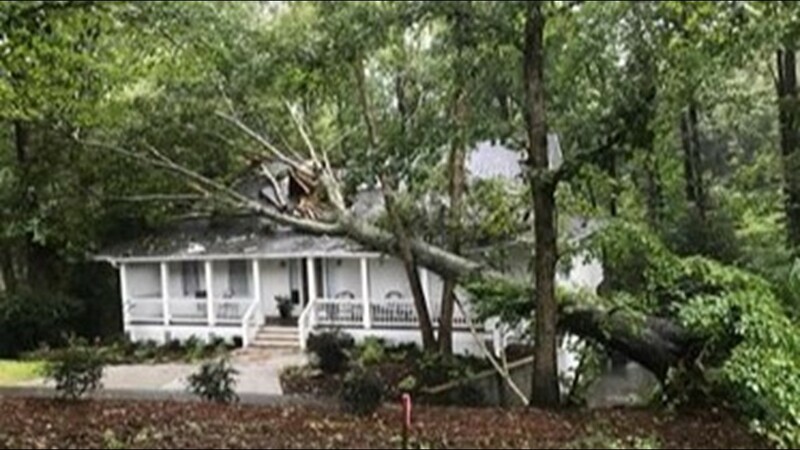 But Head said had the timing had been off by another second, it could have been deadly. 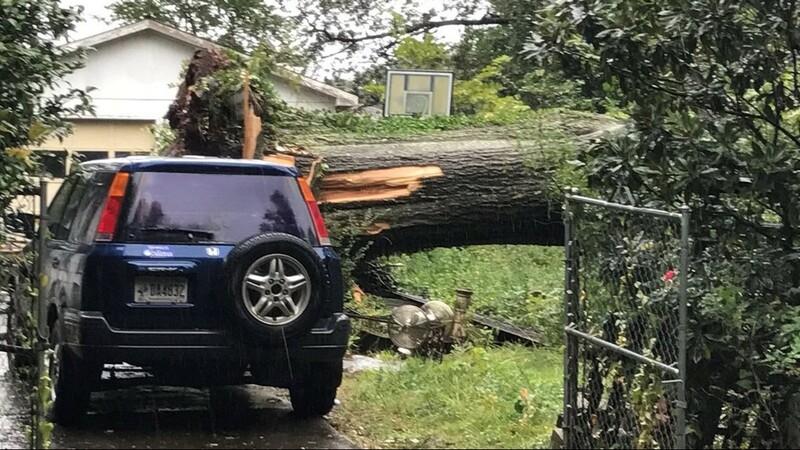 "If she had been looking at the radio or on her phone, it would have been a different story," he said. 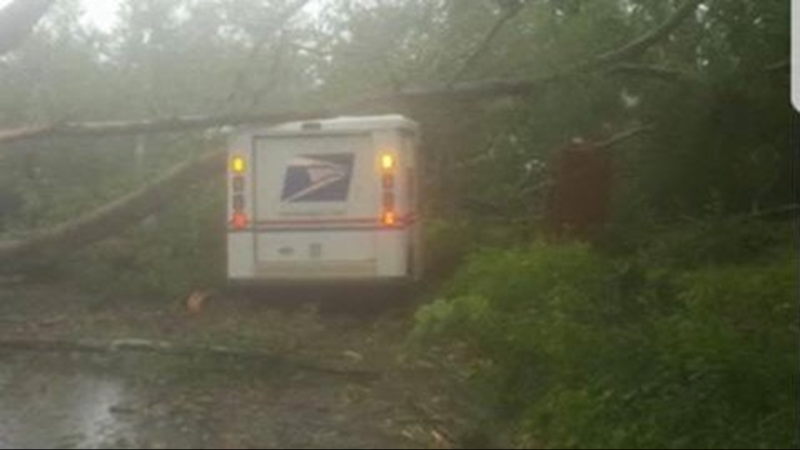 "She was very lucky...I was very lucky to get my truck stopped!" 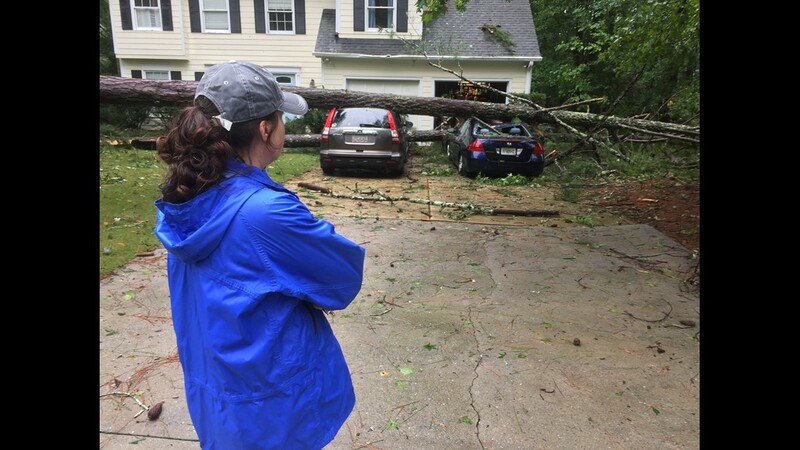 Head said he never got the woman's name, but thinks she will be OK. "It was pretty rough out there." 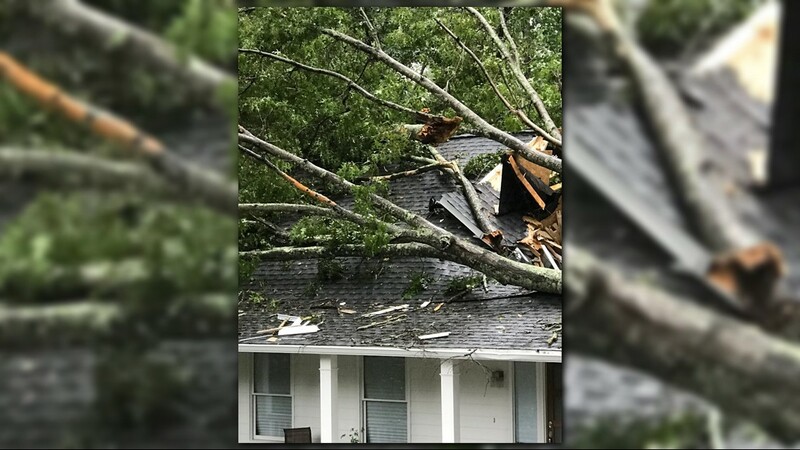 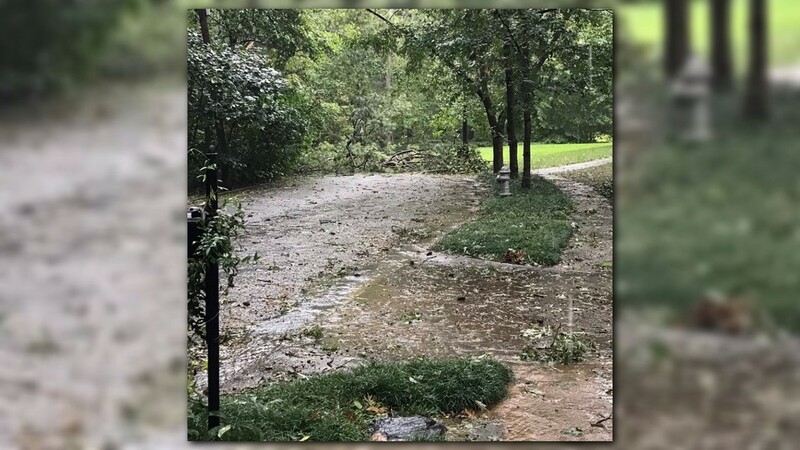 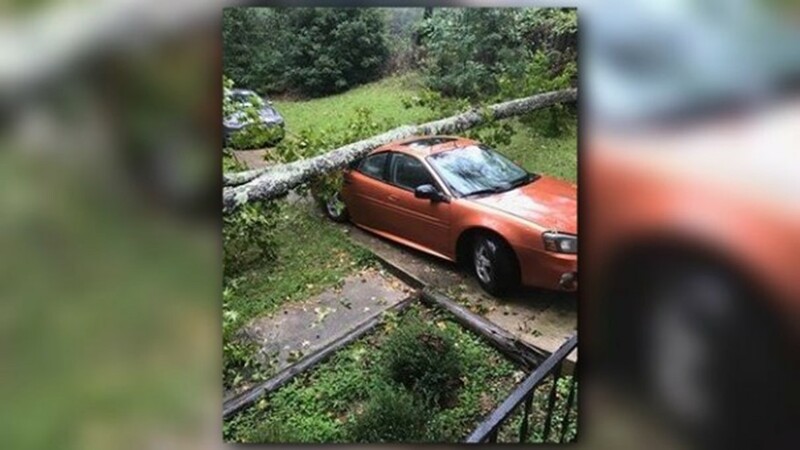 Though the remnants of the storm are expected to continue to push out of Georgia and move into parts of Alabama and western Tennessee by Tuesday, Head had a warning for other drivers: "If you can stay home, stay home," he said. 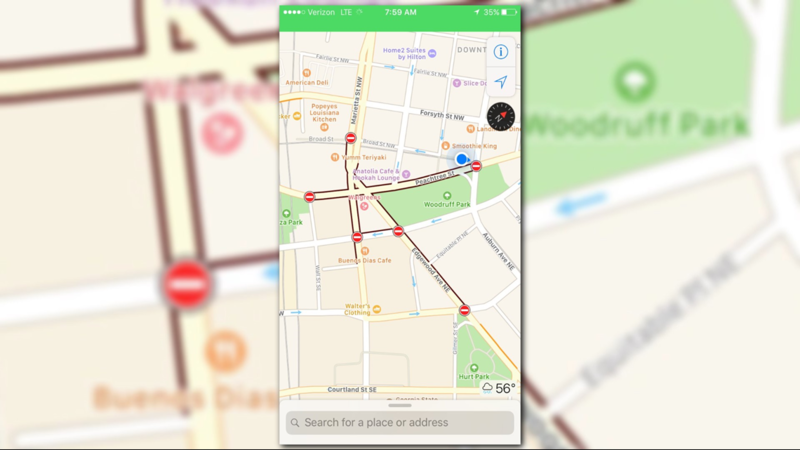 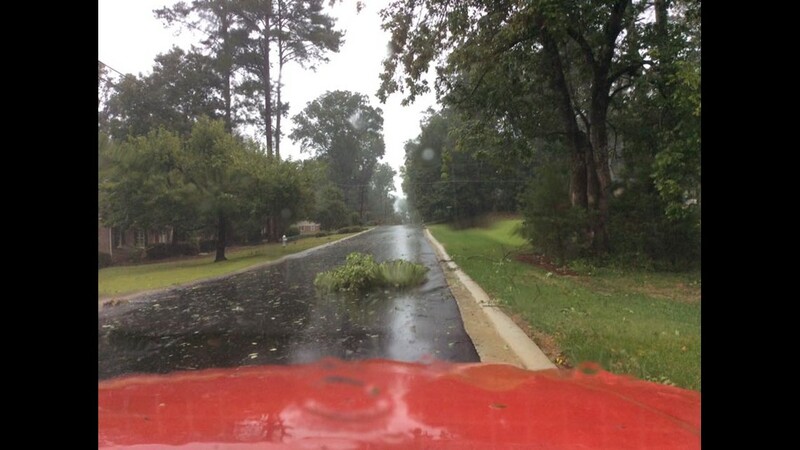 "But, if you have to get on the road, pay attention to your surroundings. 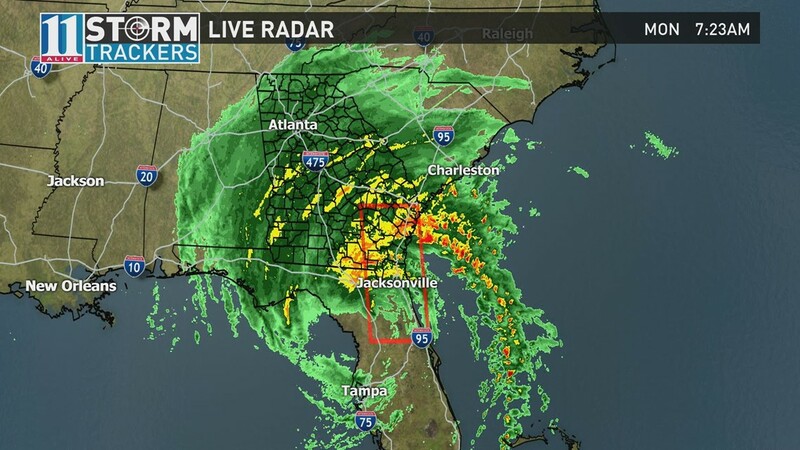 That's all you can really do, drive steady and go slow." 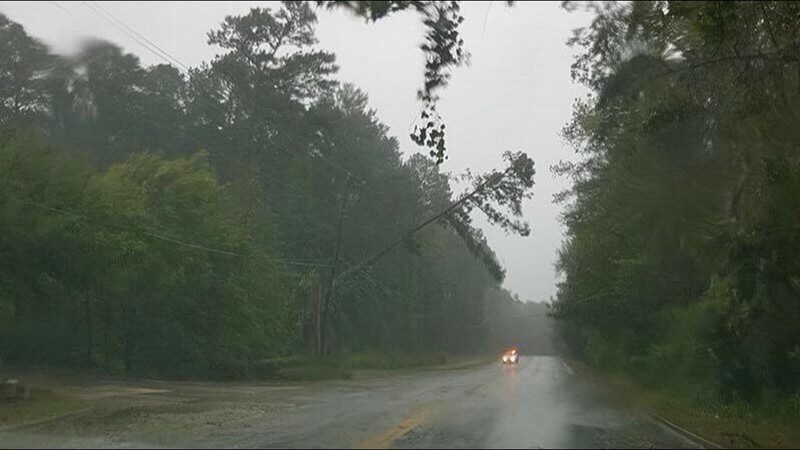 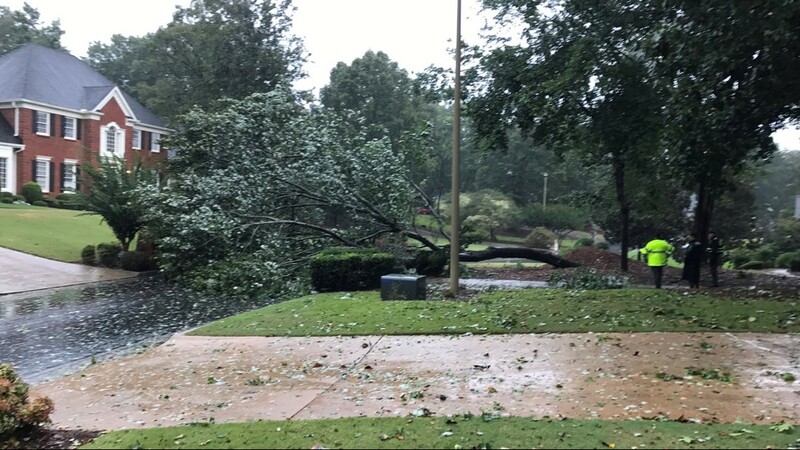 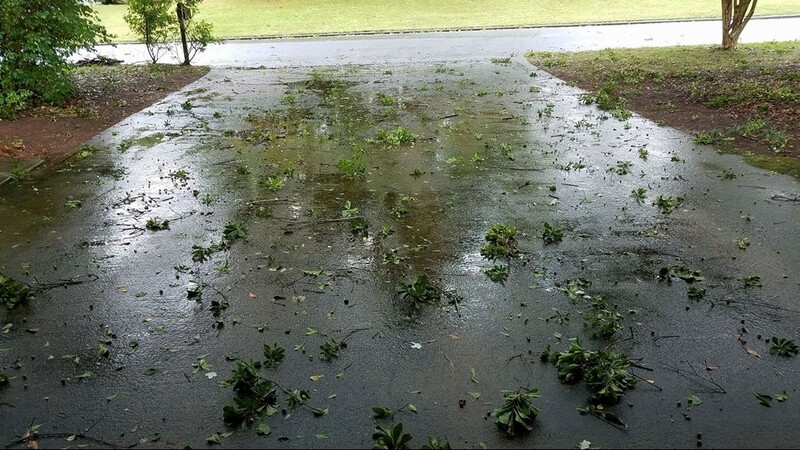 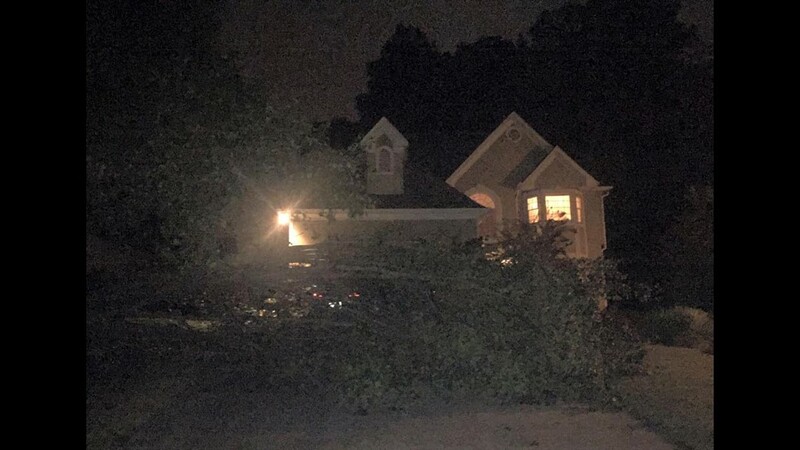 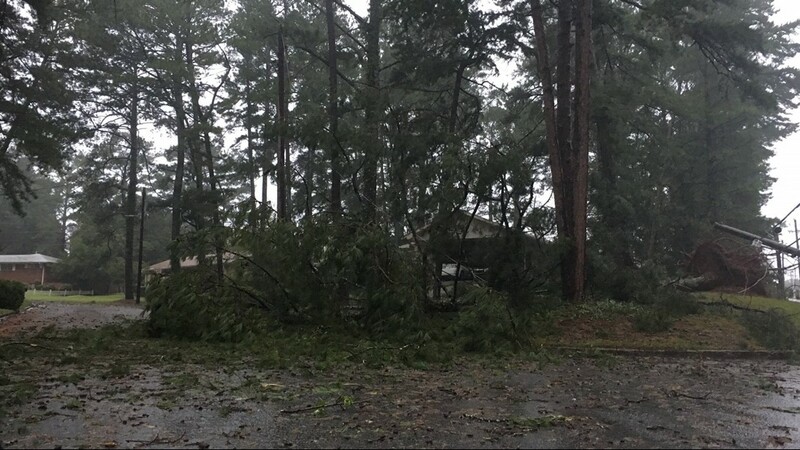 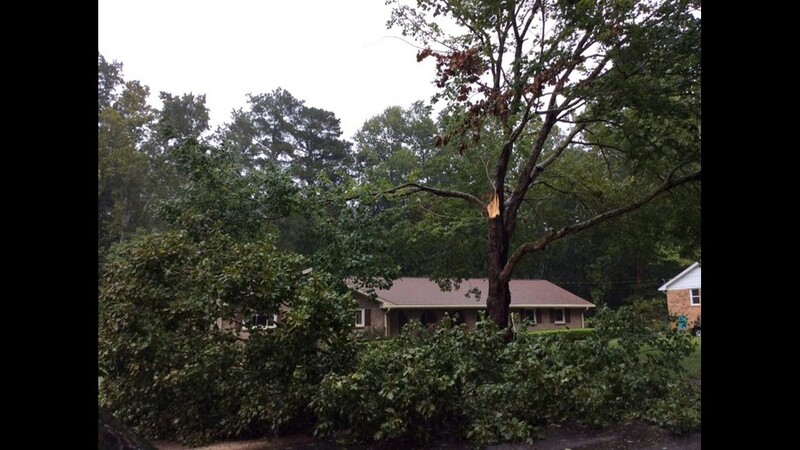 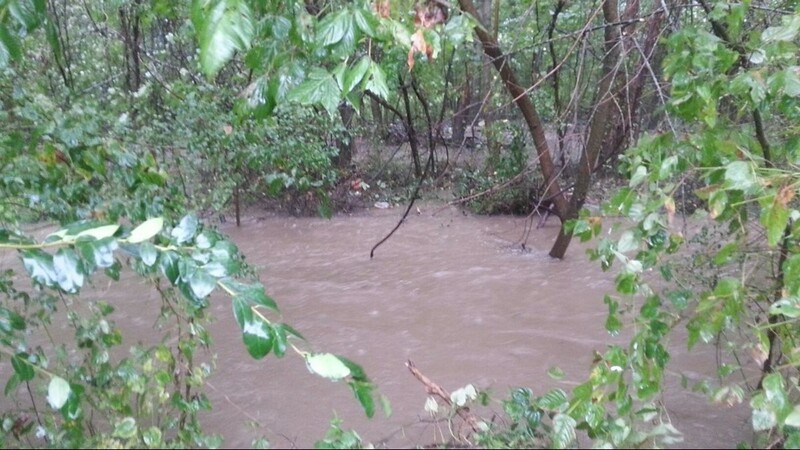 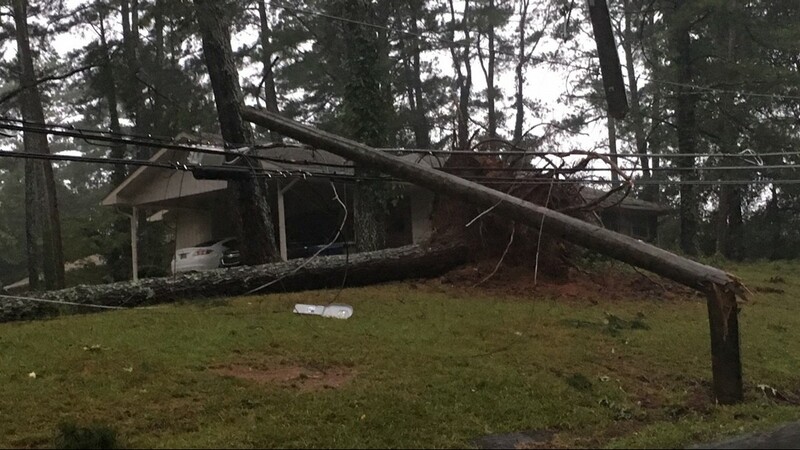 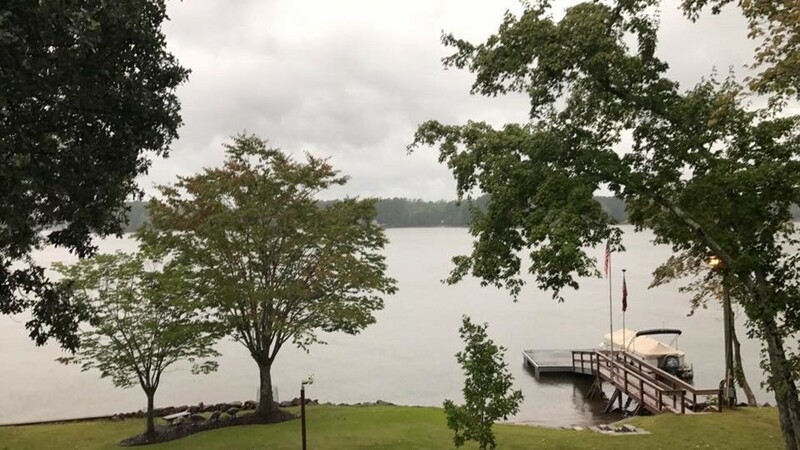 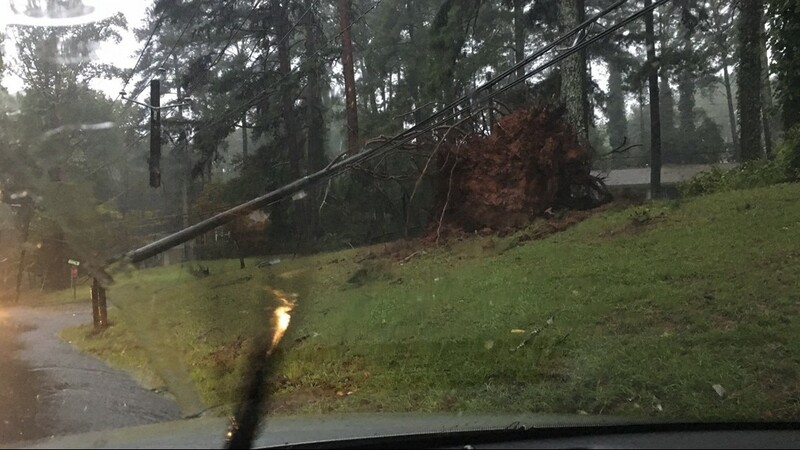 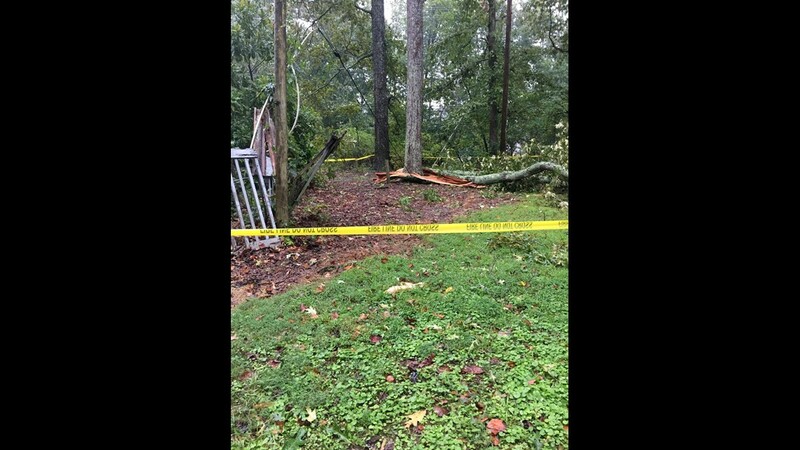 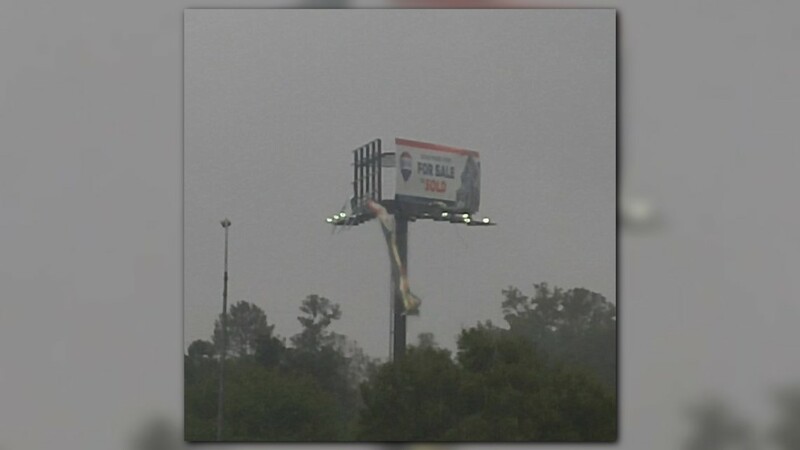 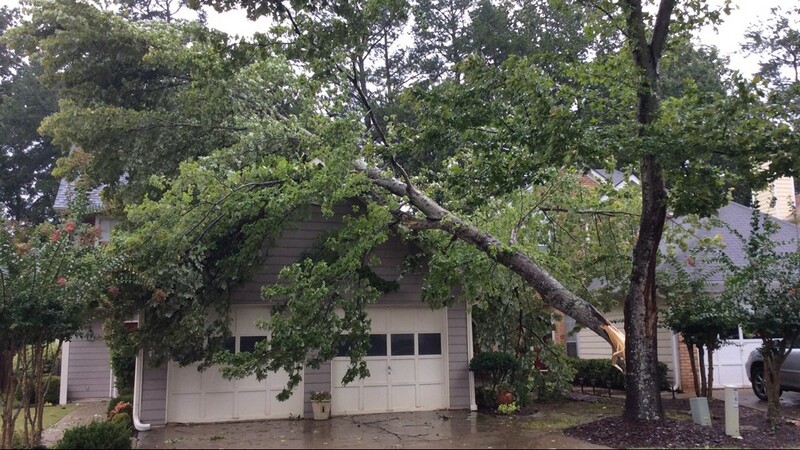 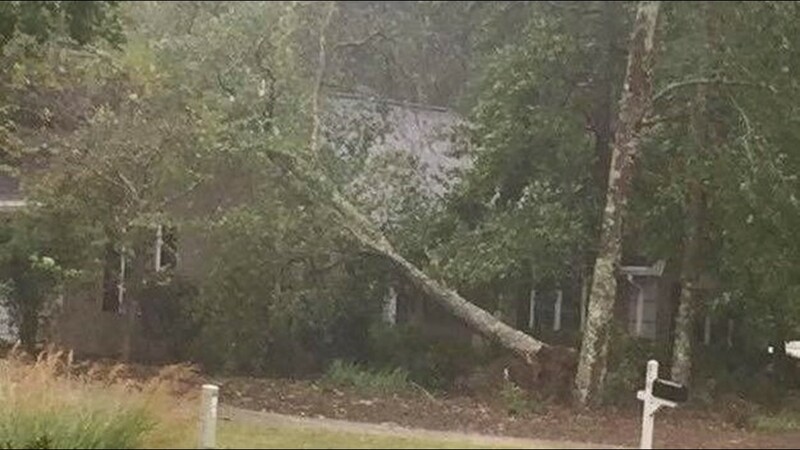 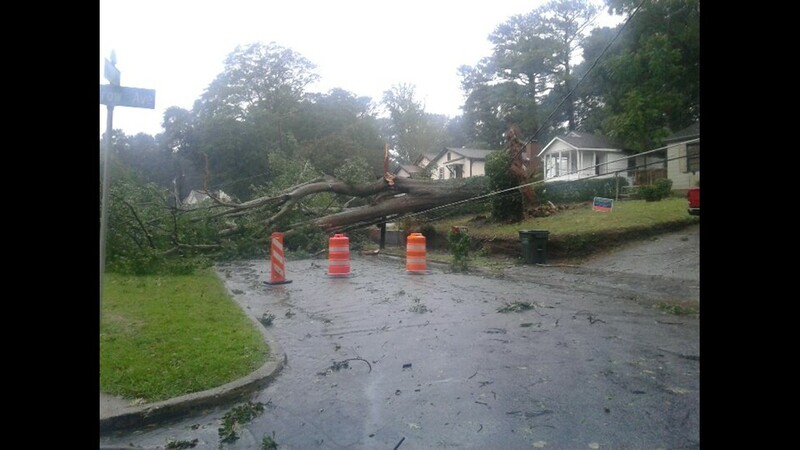 Lynda English / Peachtree City, Ga."There was wind but not bad wind. 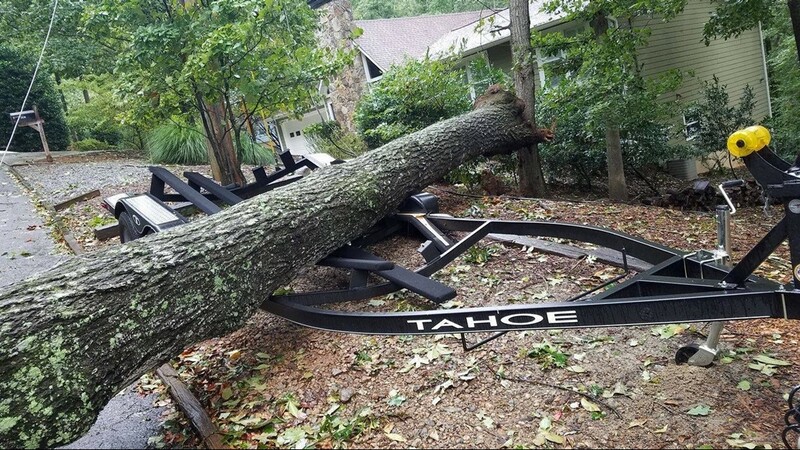 We came home and found it. 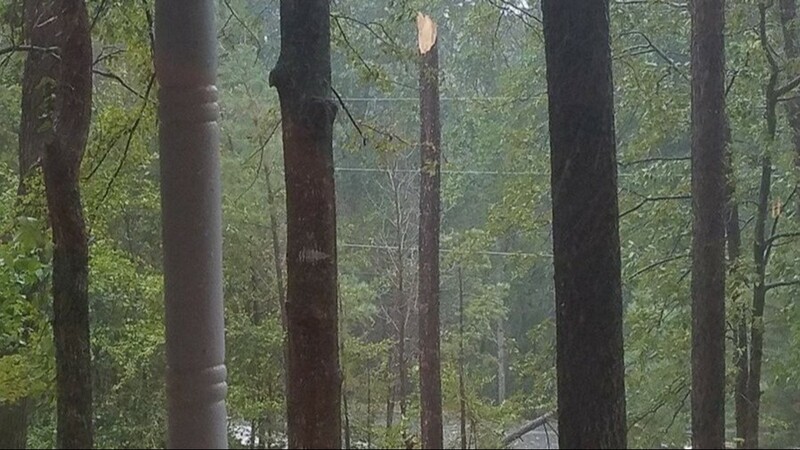 It appeared alive but LOOK no Roots!!! 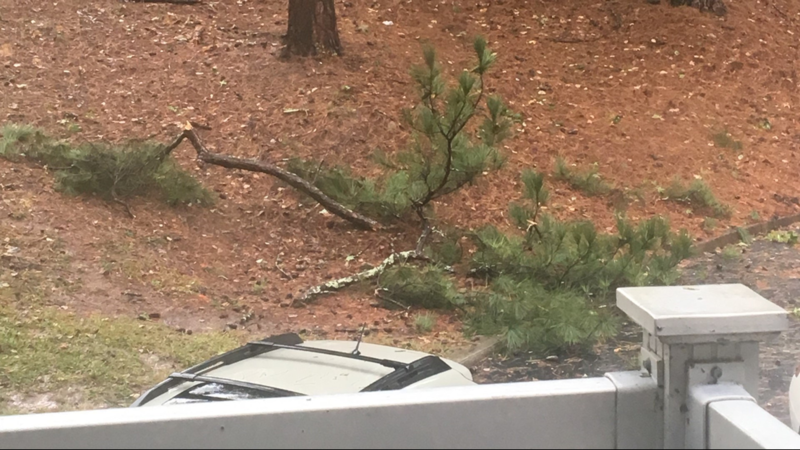 And it was green! 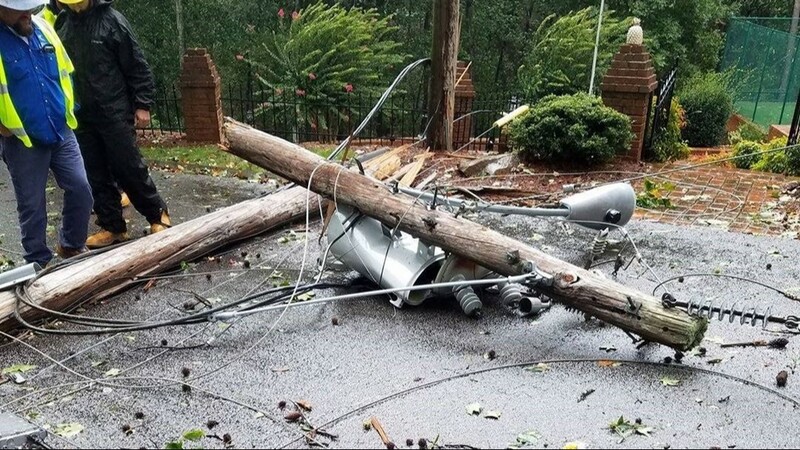 Thankful no one was hurt." 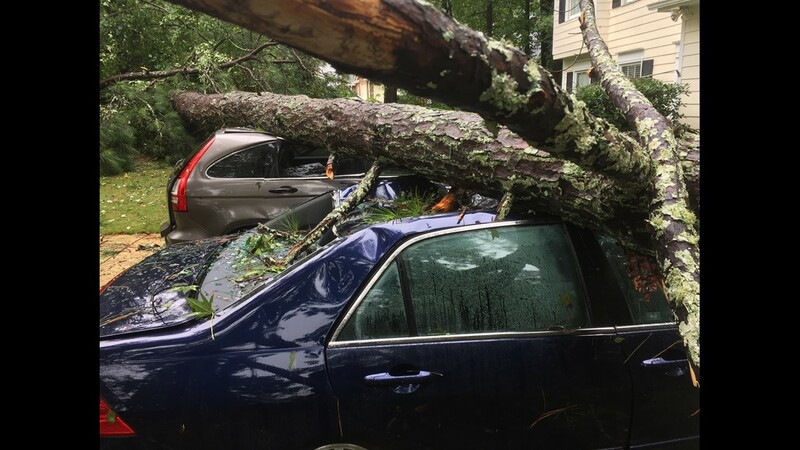 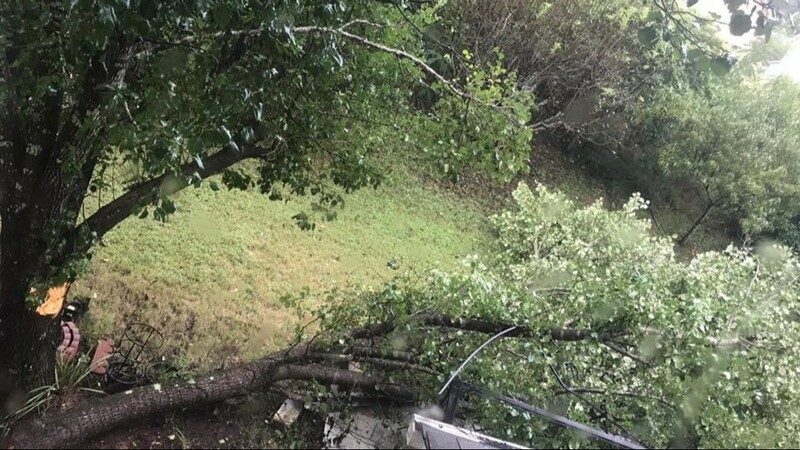 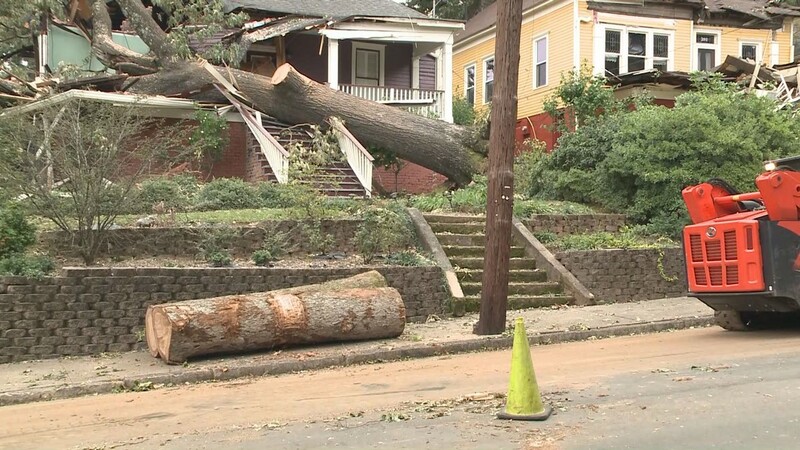 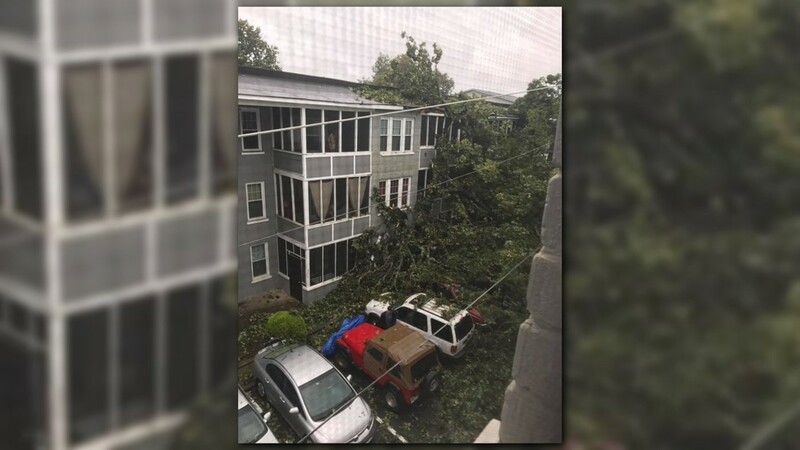 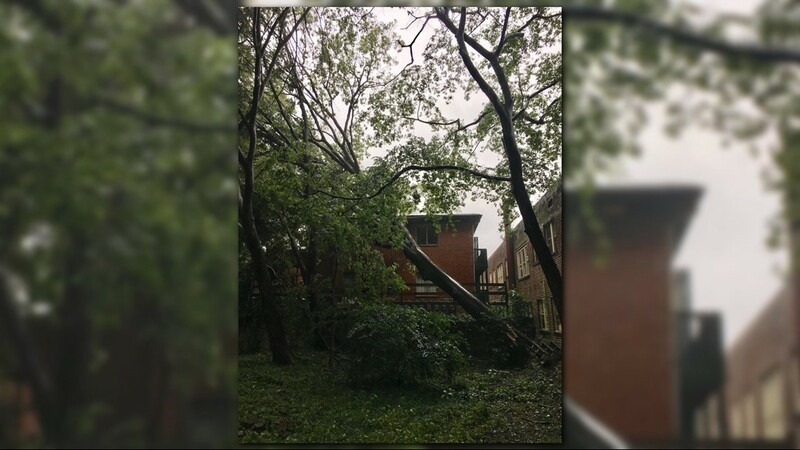 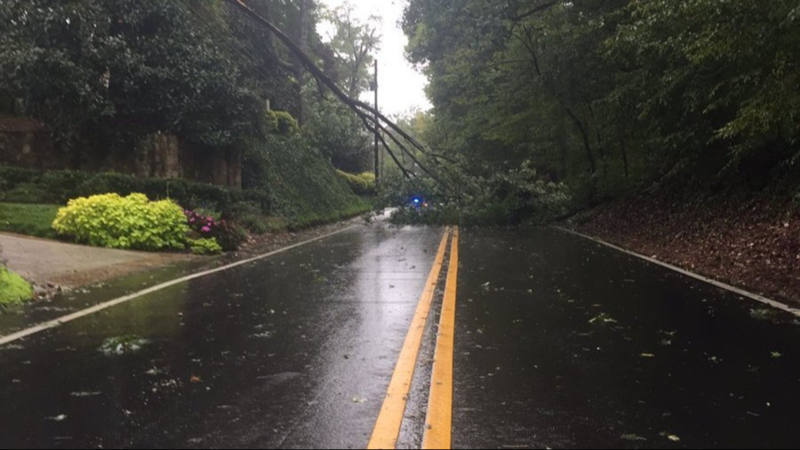 A tree fell on top of a car parked in a Lawrenceville driverway. 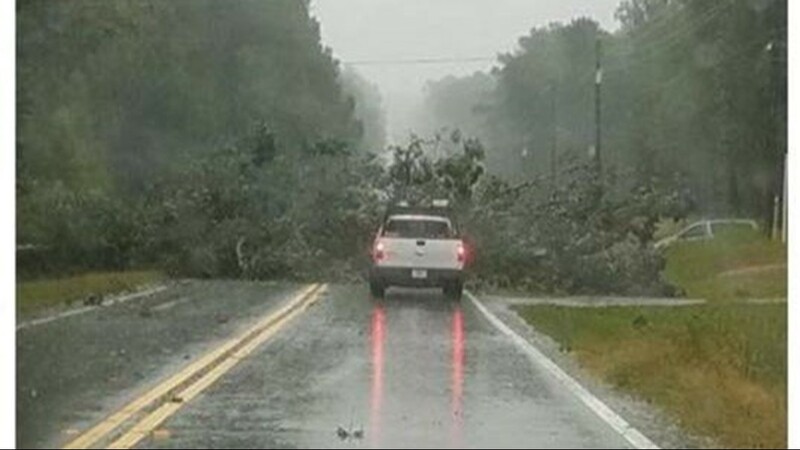 "if you have to get on the road, pay attention to your surroundings. 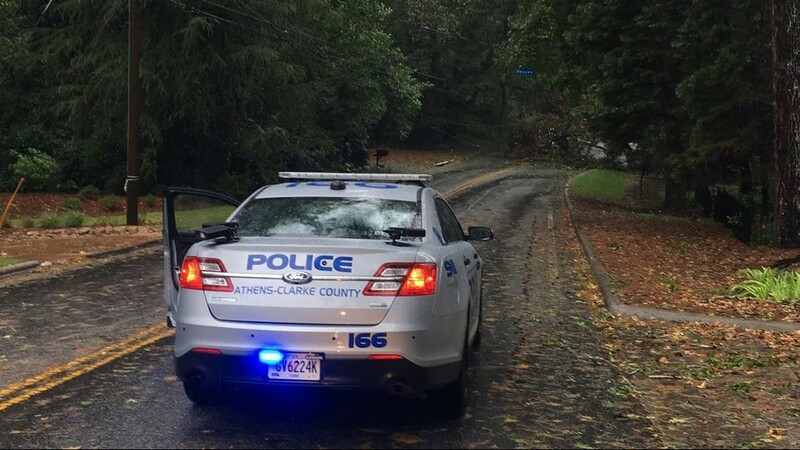 That's all you can really do, drive steady and go slow."